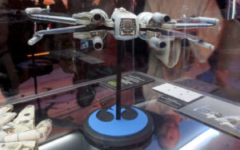 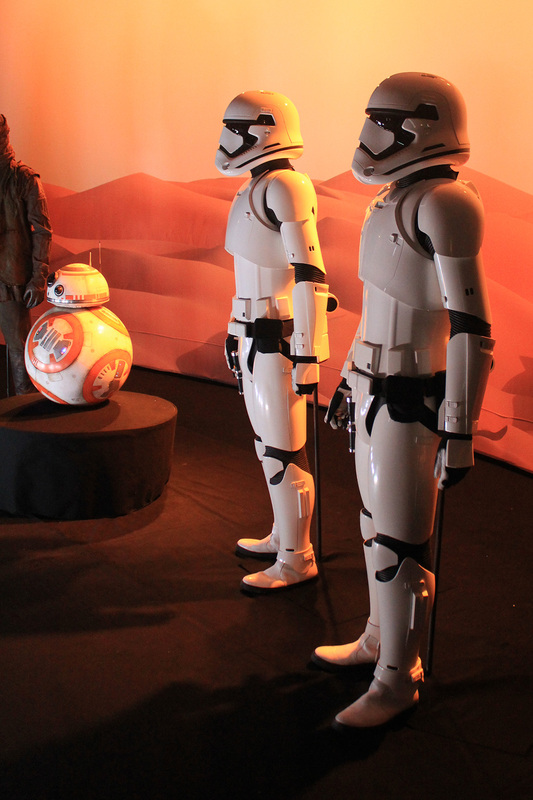 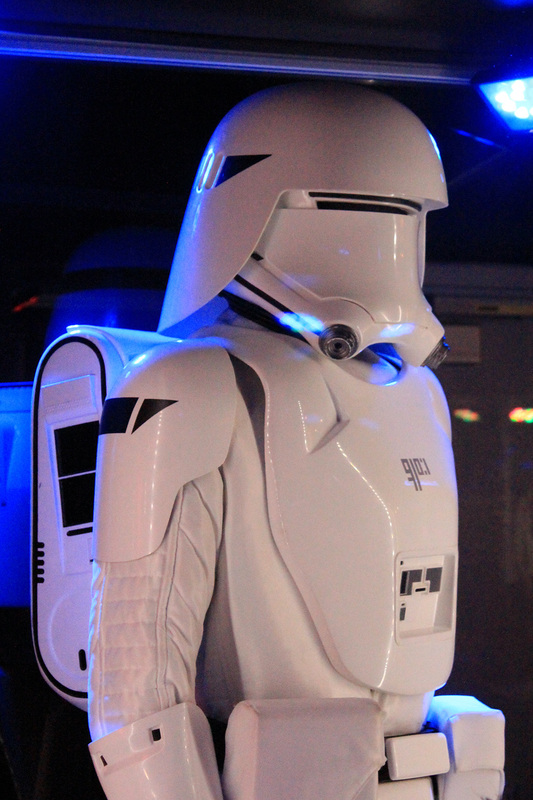 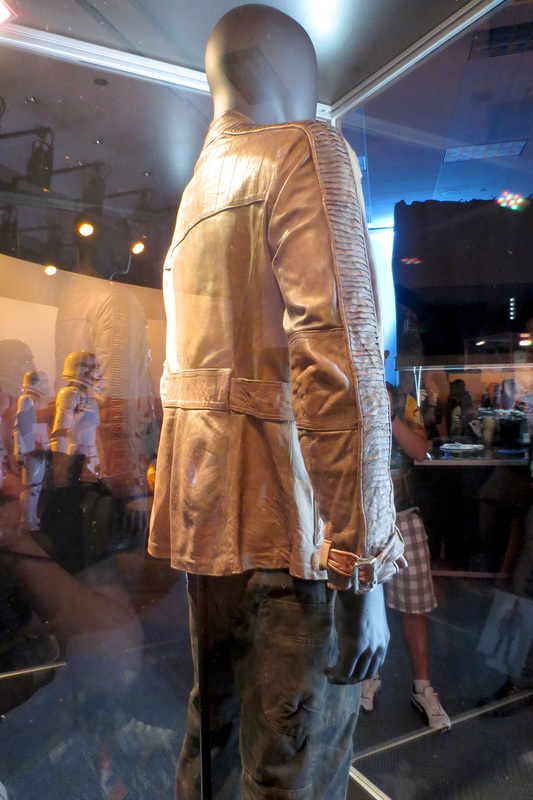 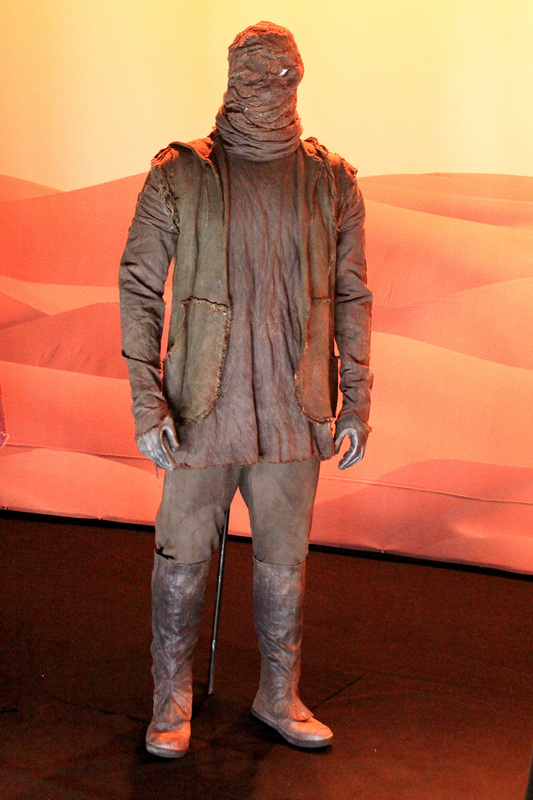 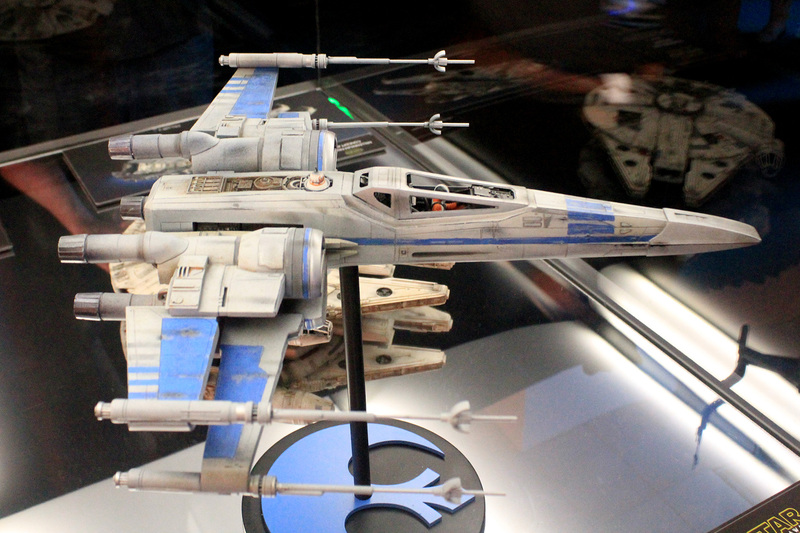 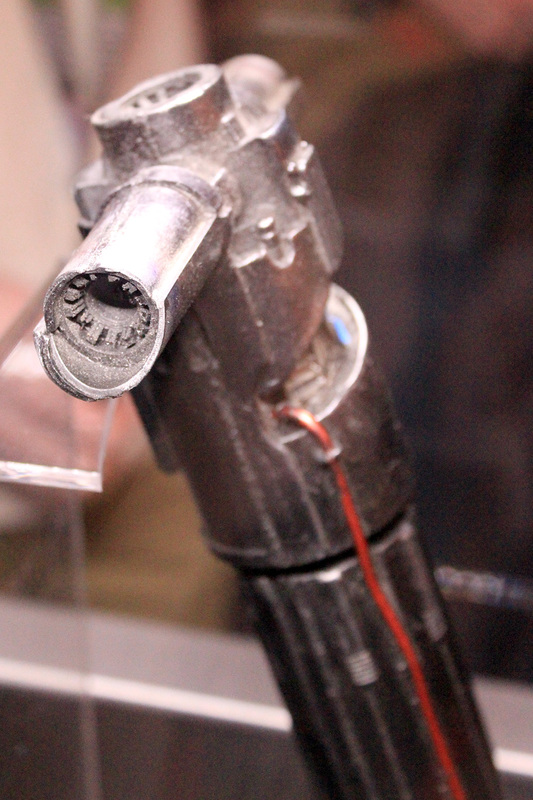 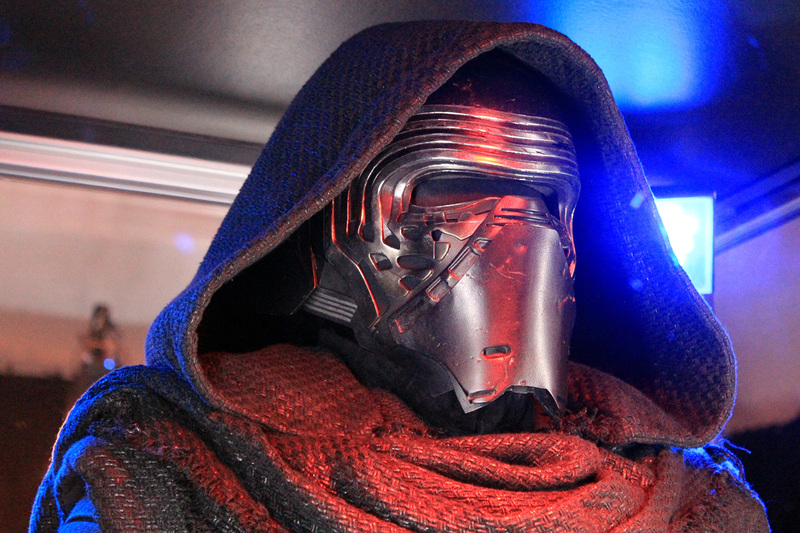 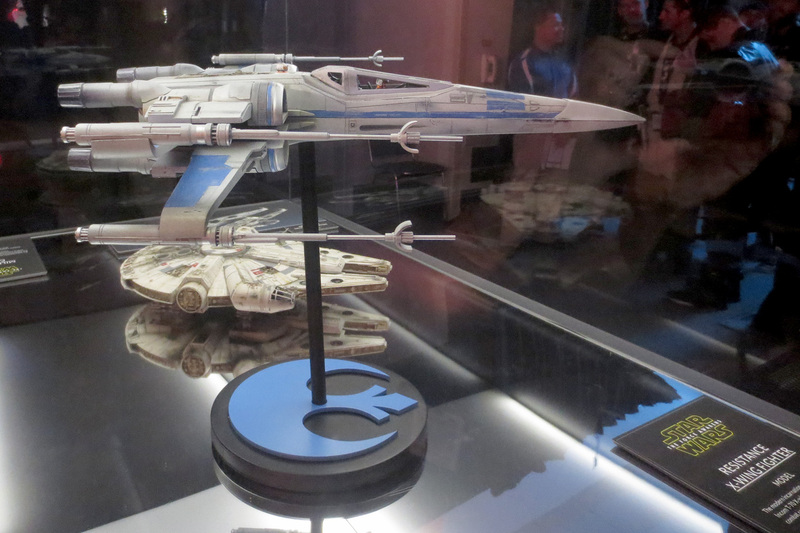 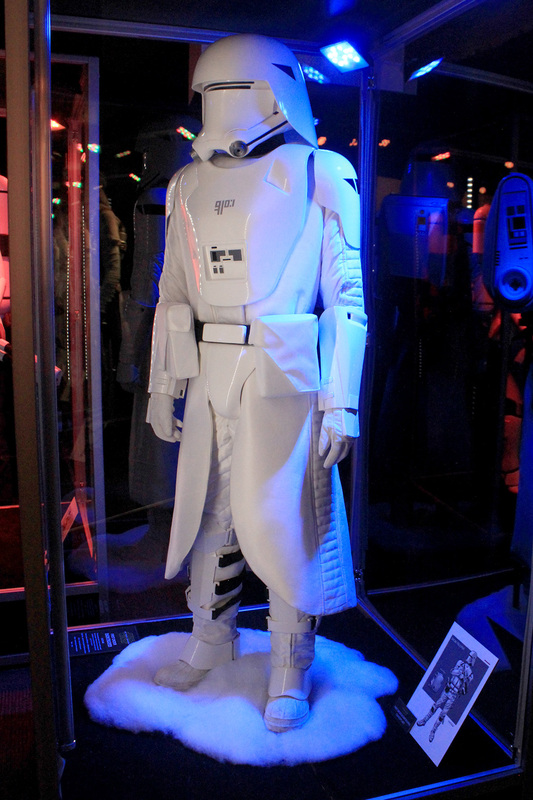 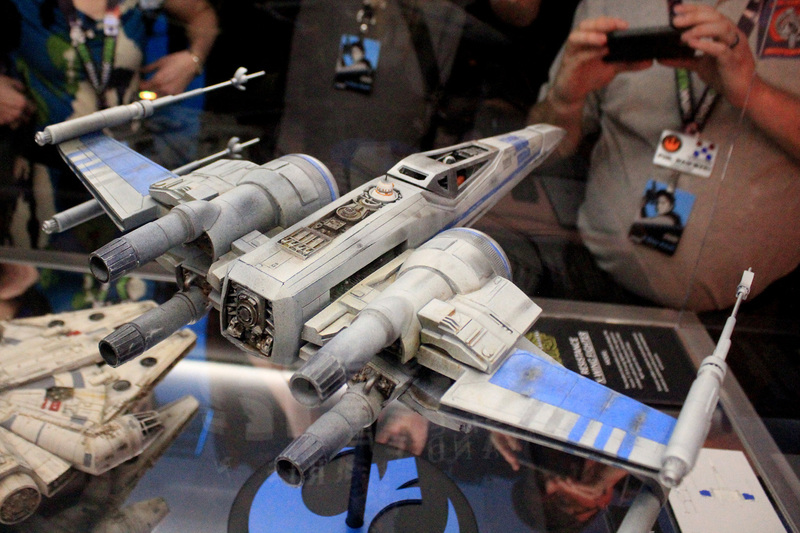 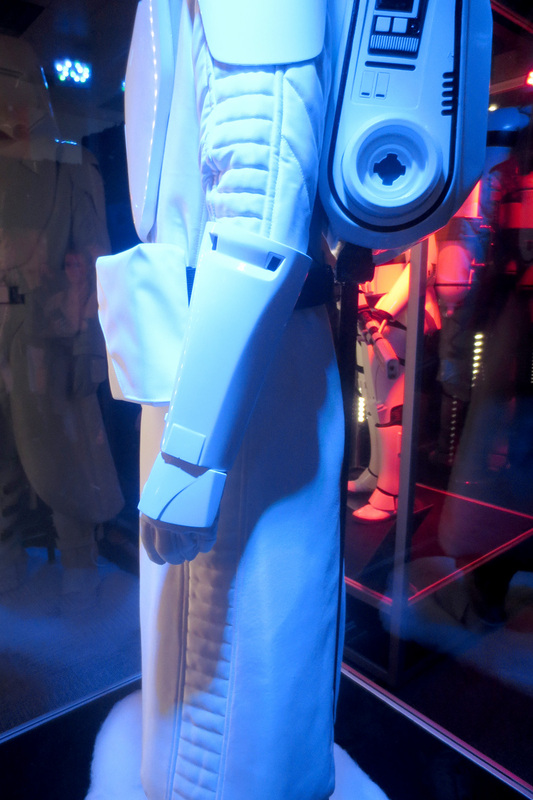 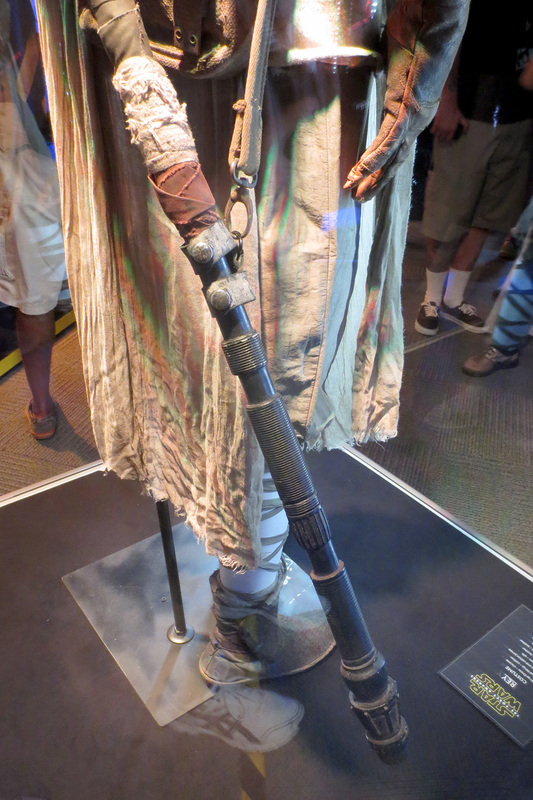 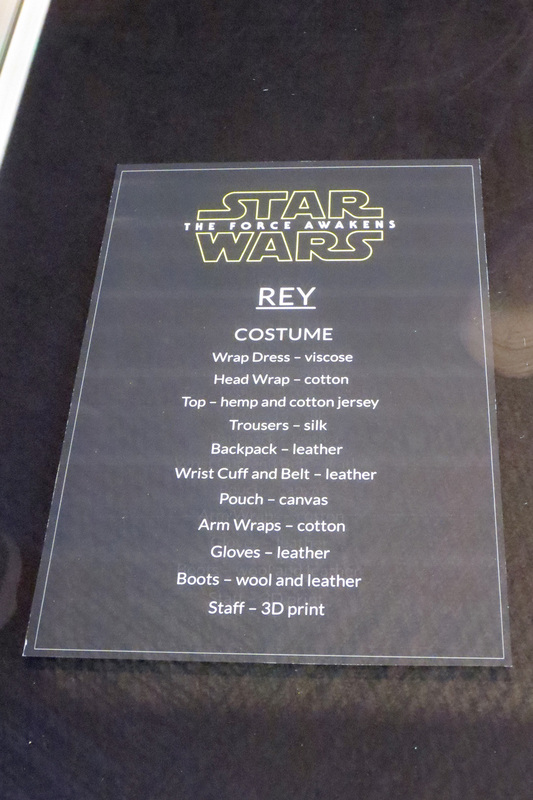 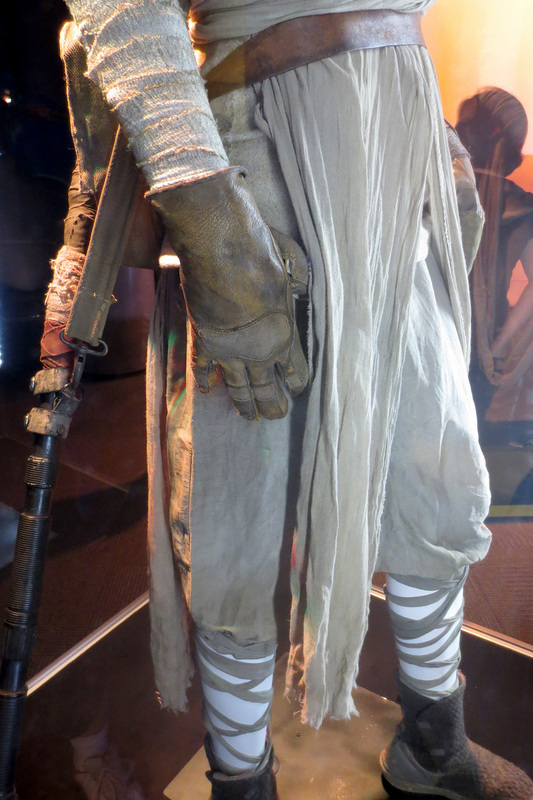 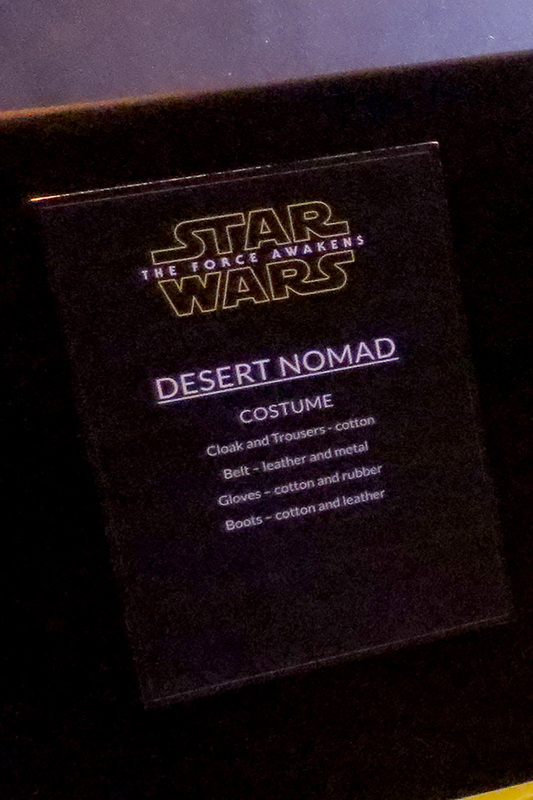 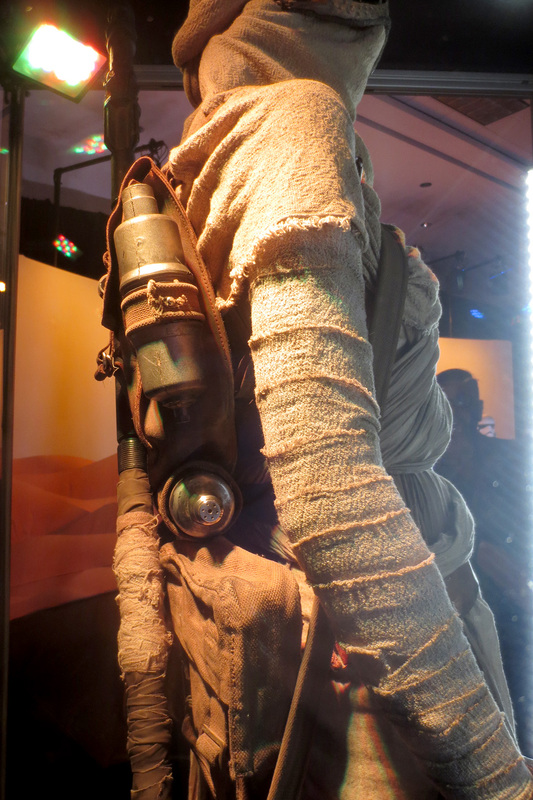 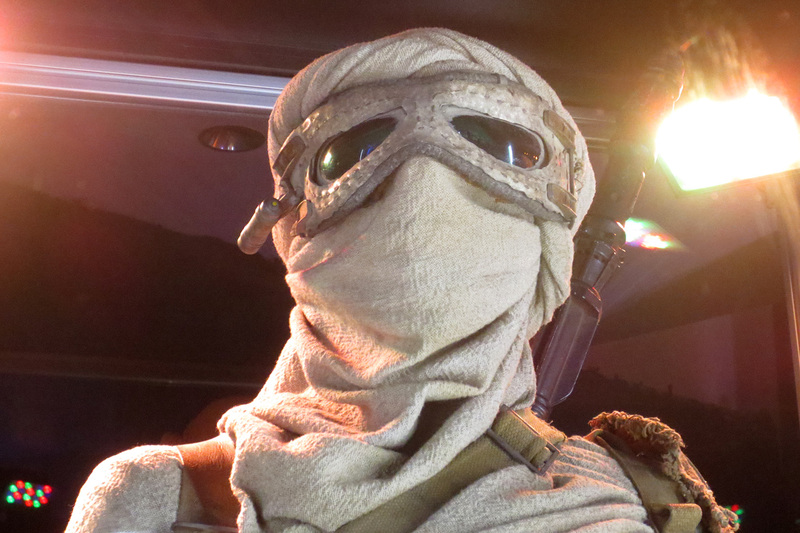 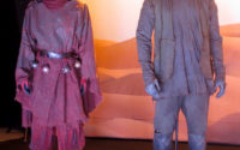 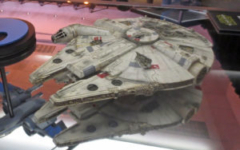 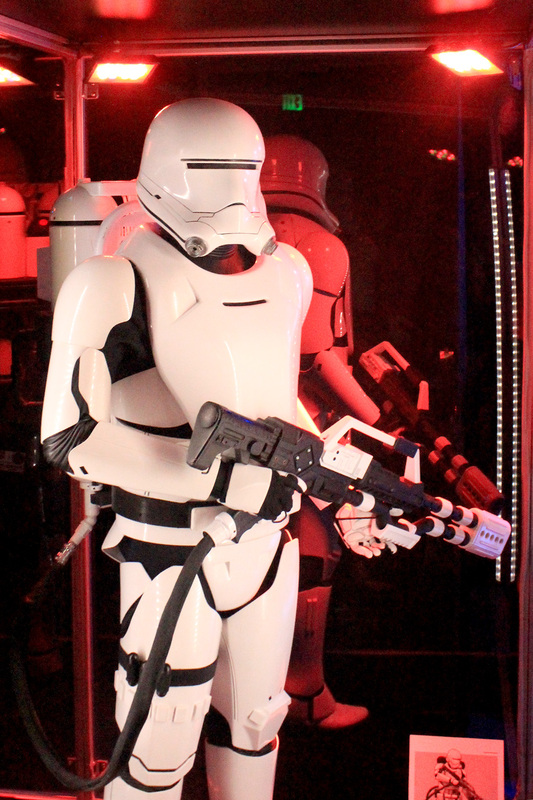 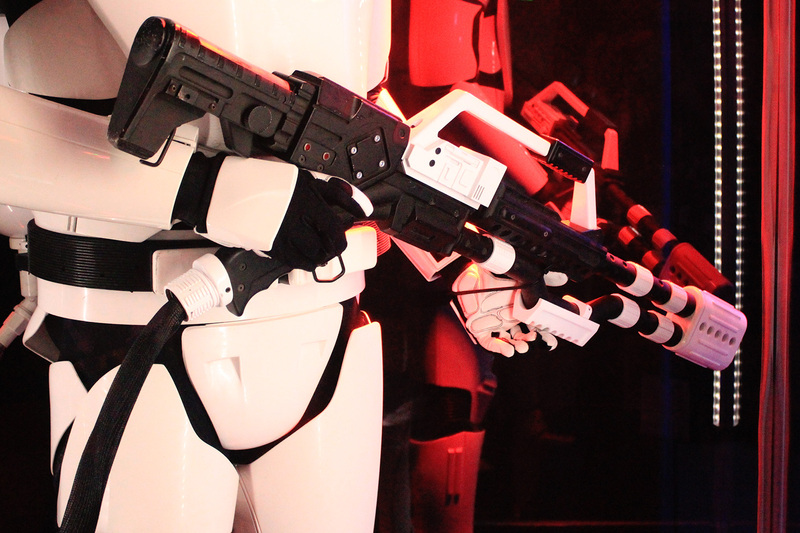 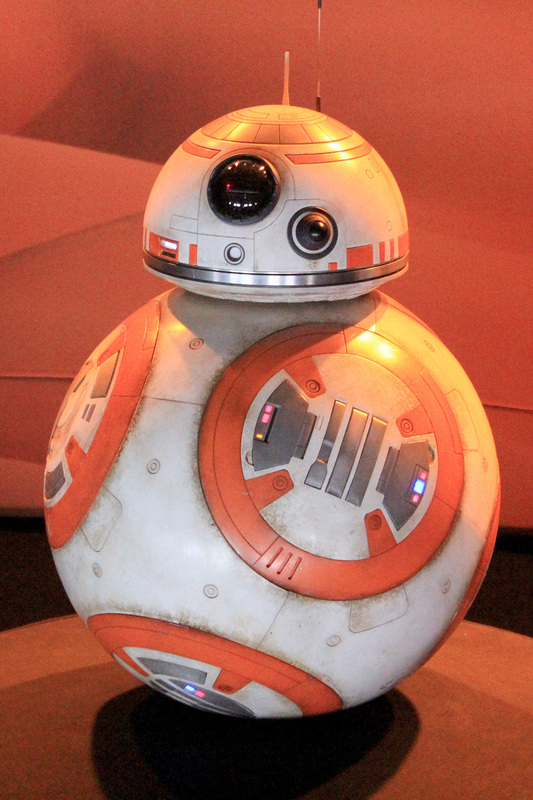 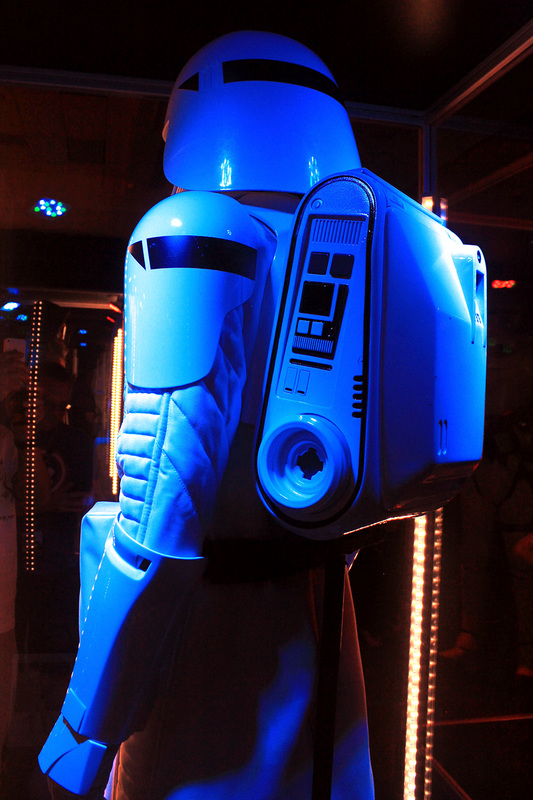 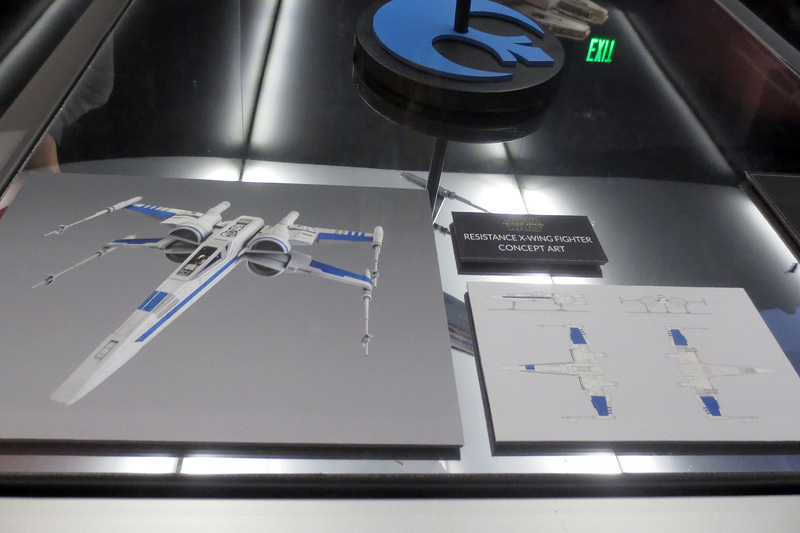 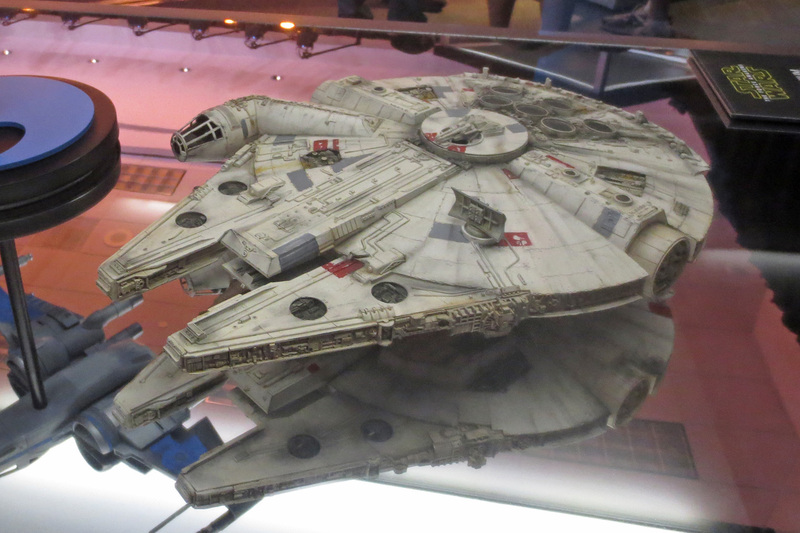 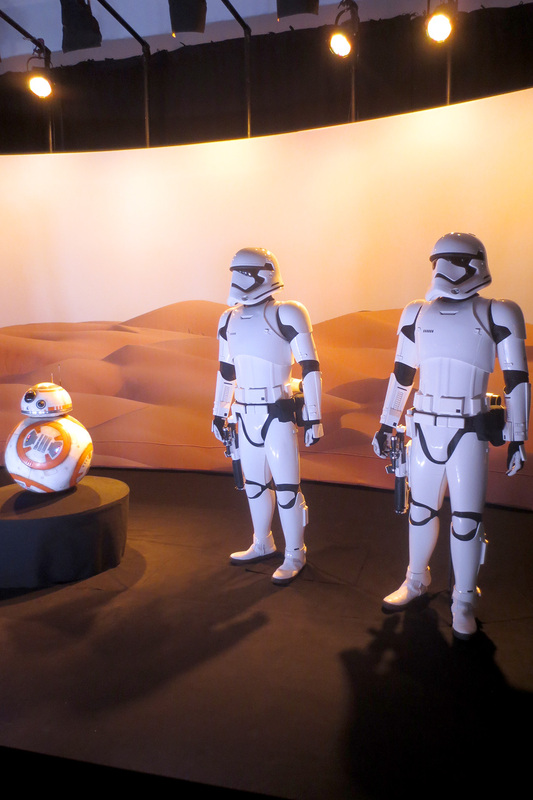 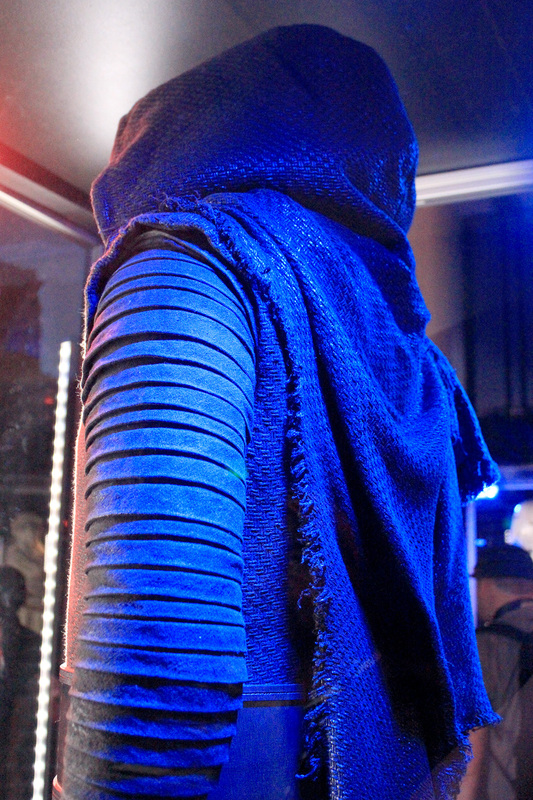 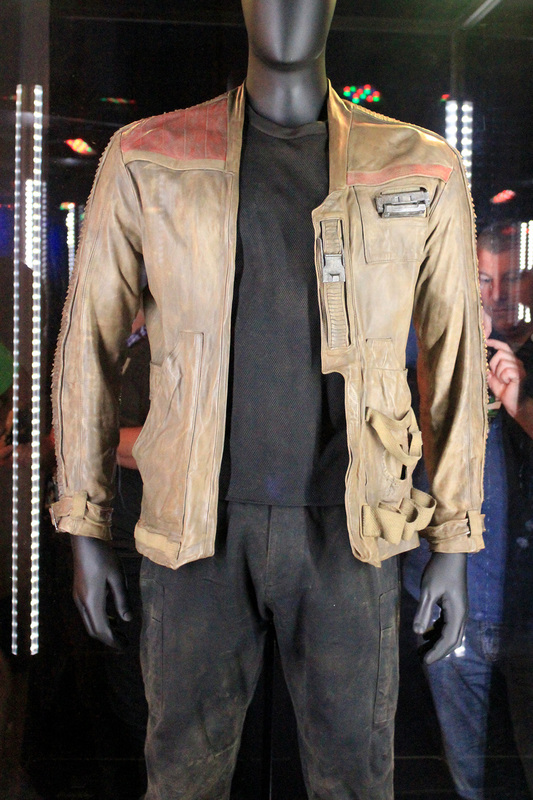 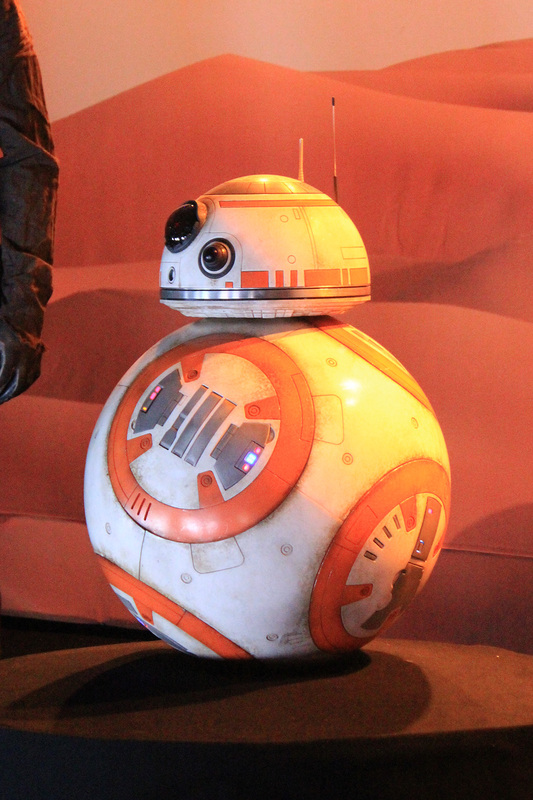 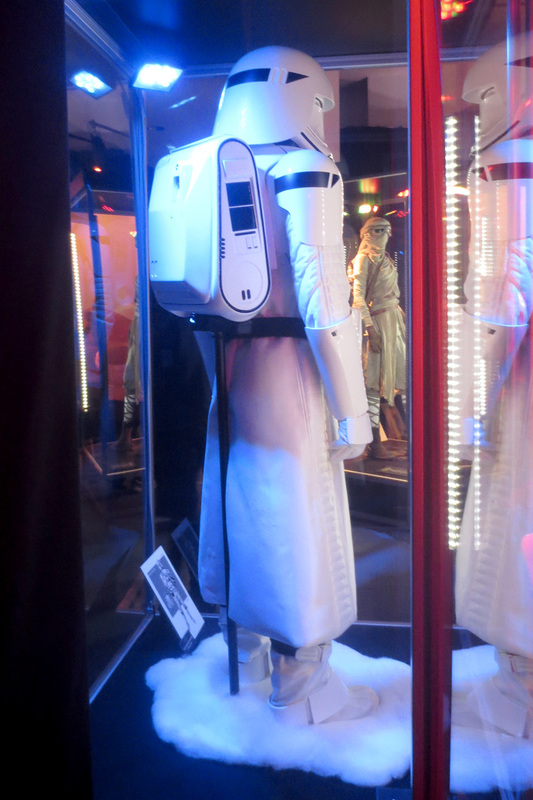 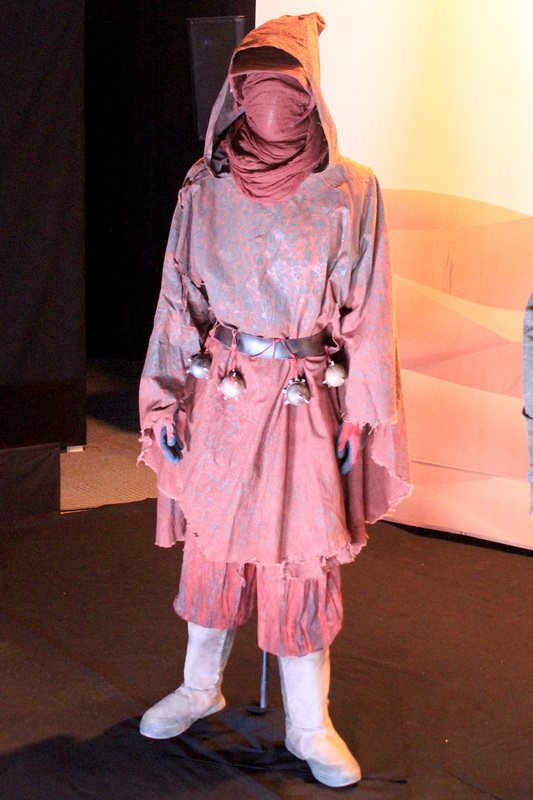 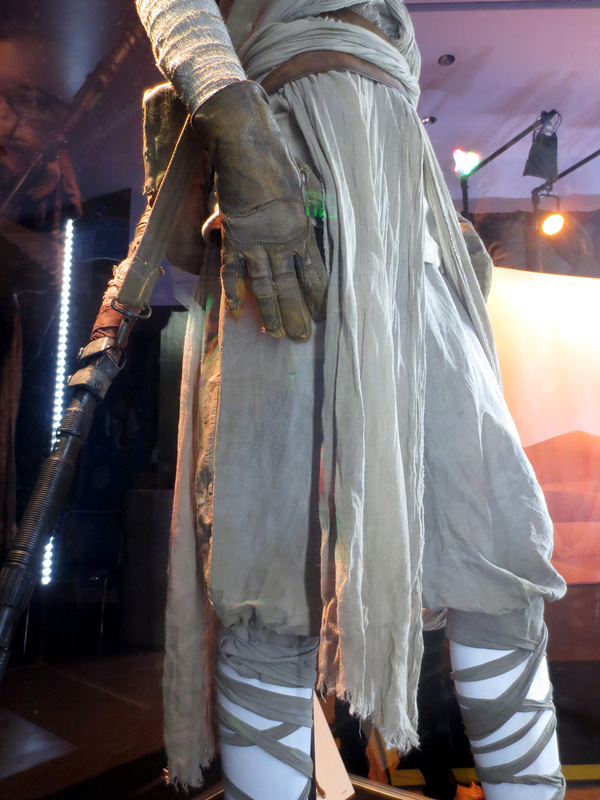 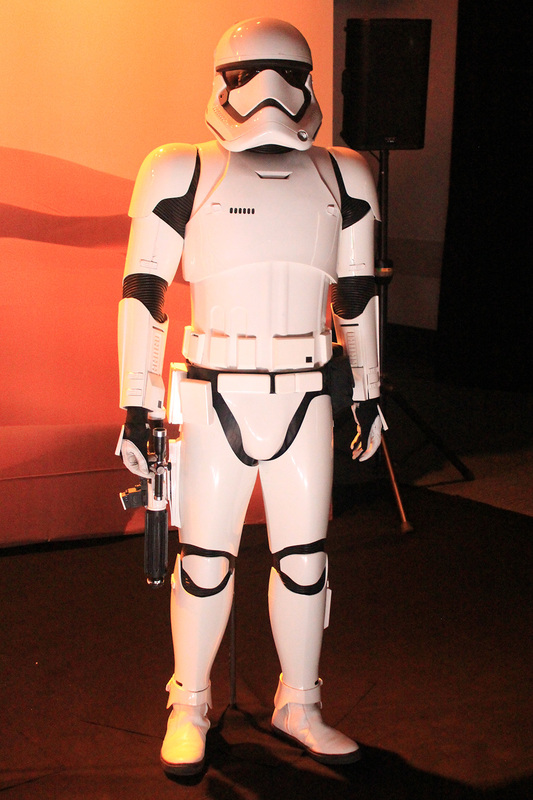 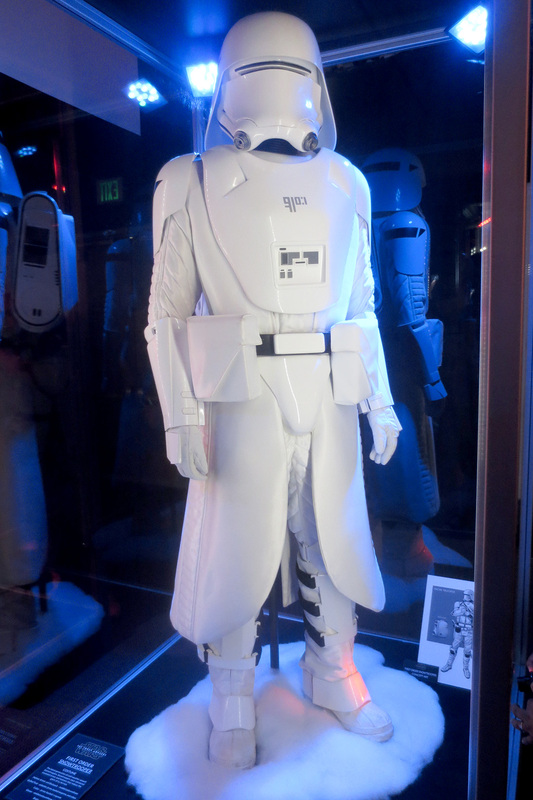 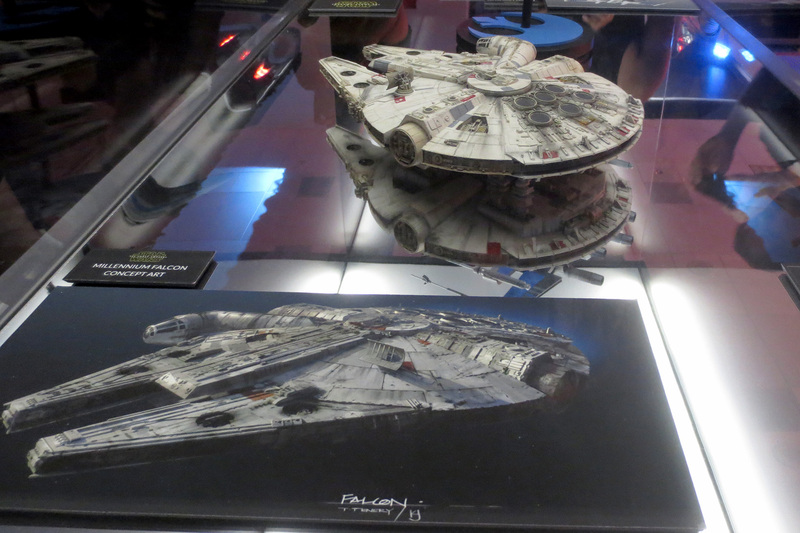 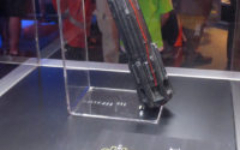 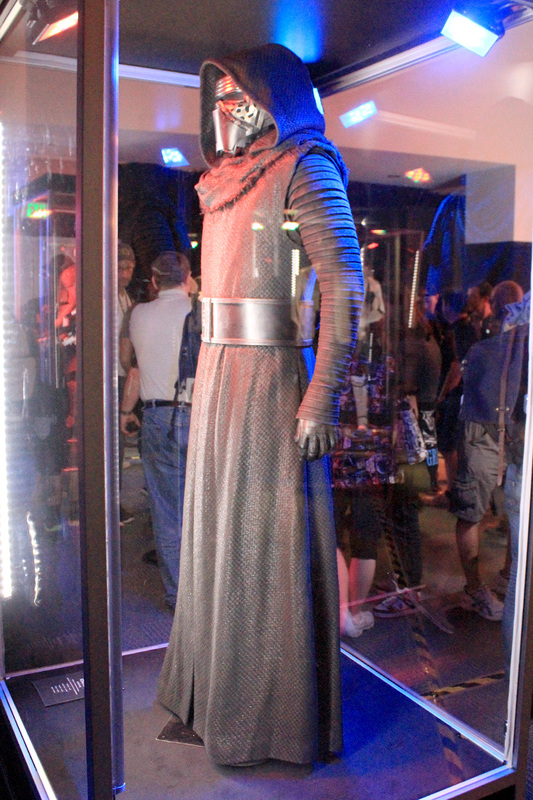 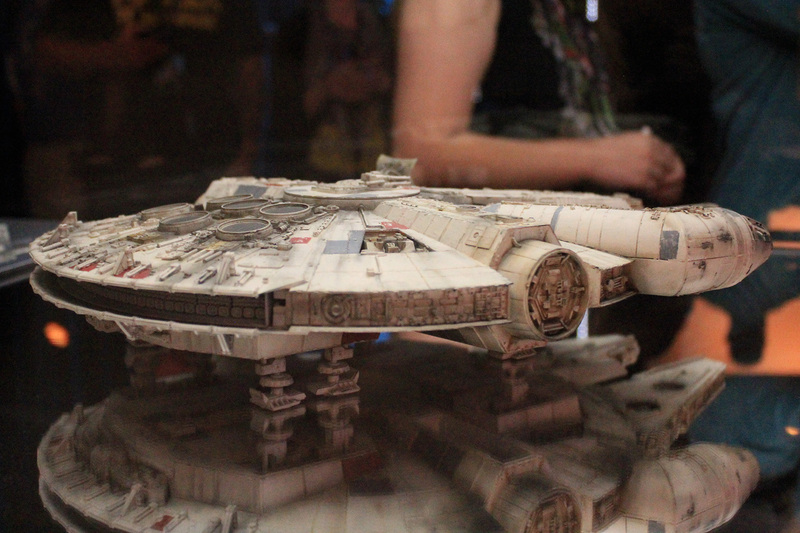 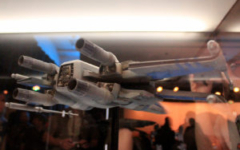 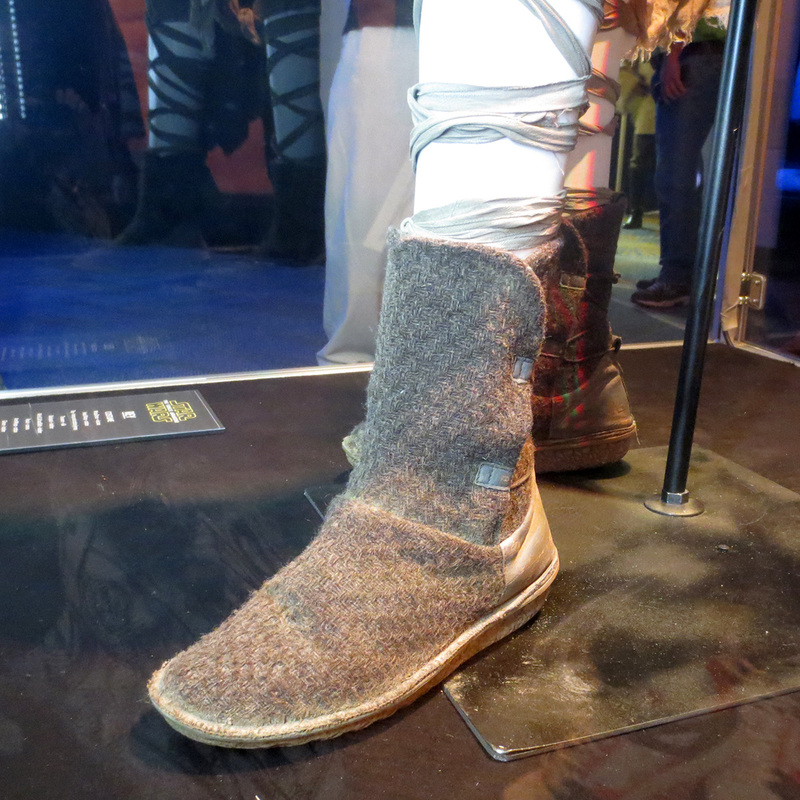 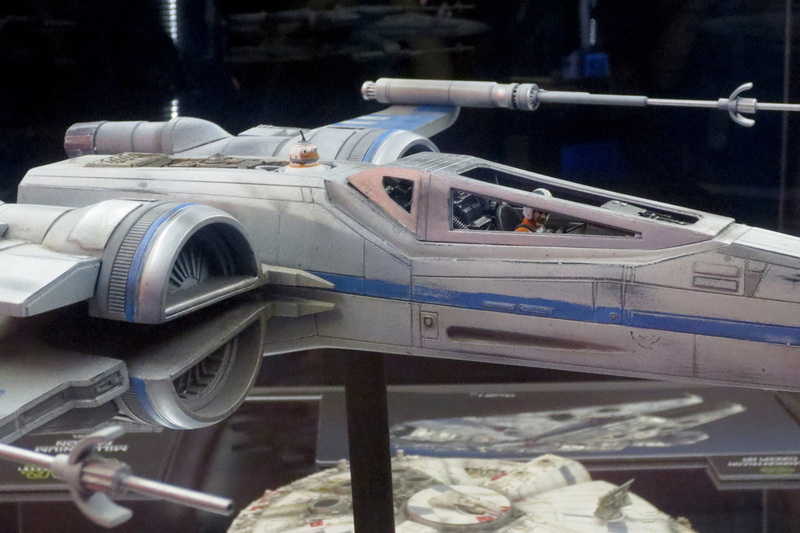 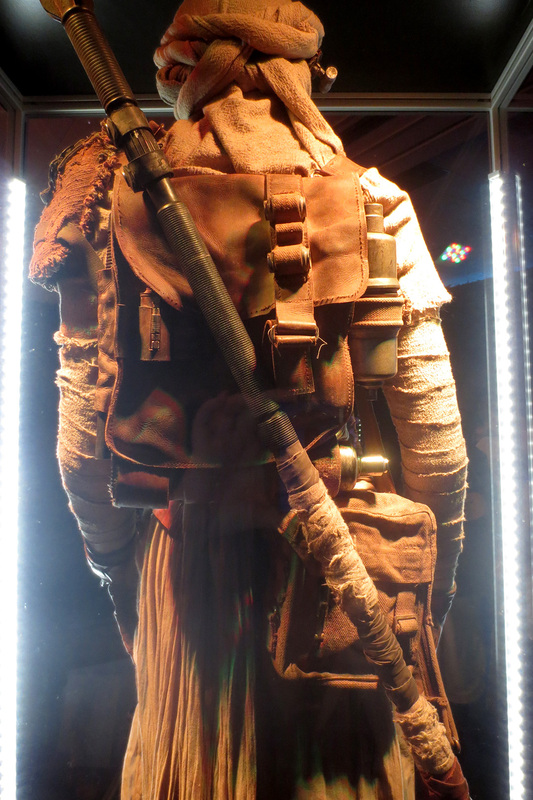 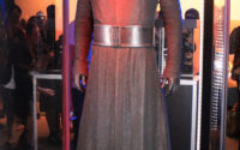 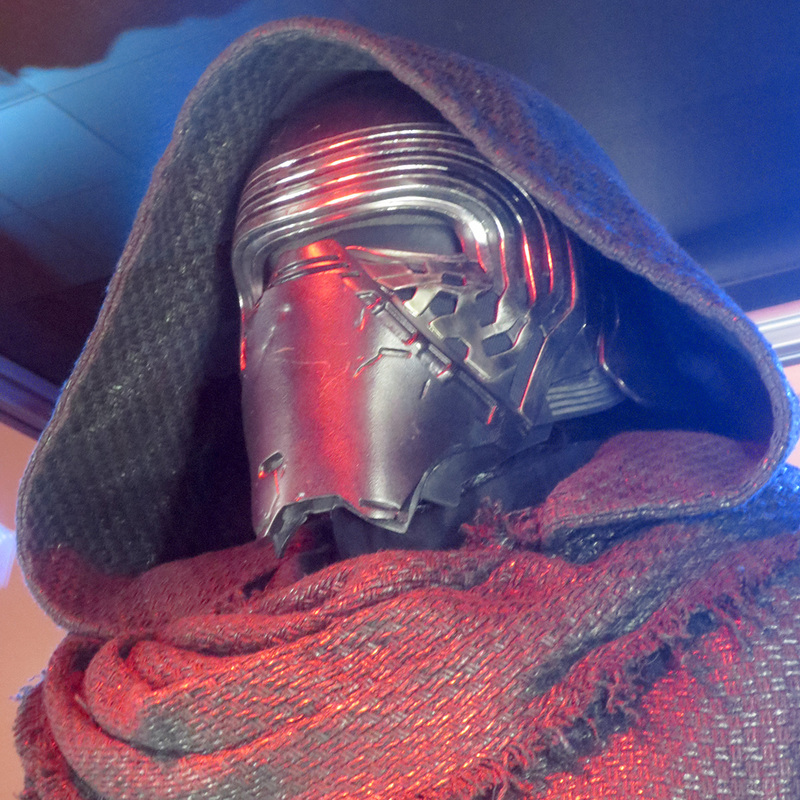 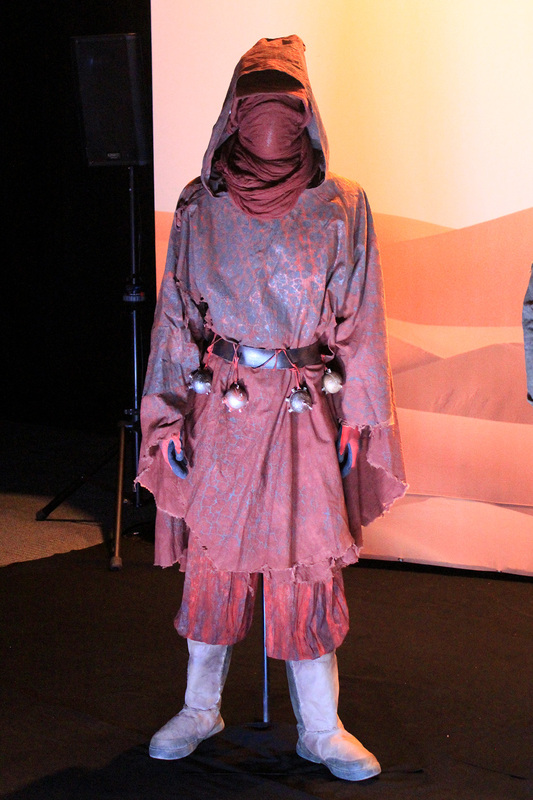 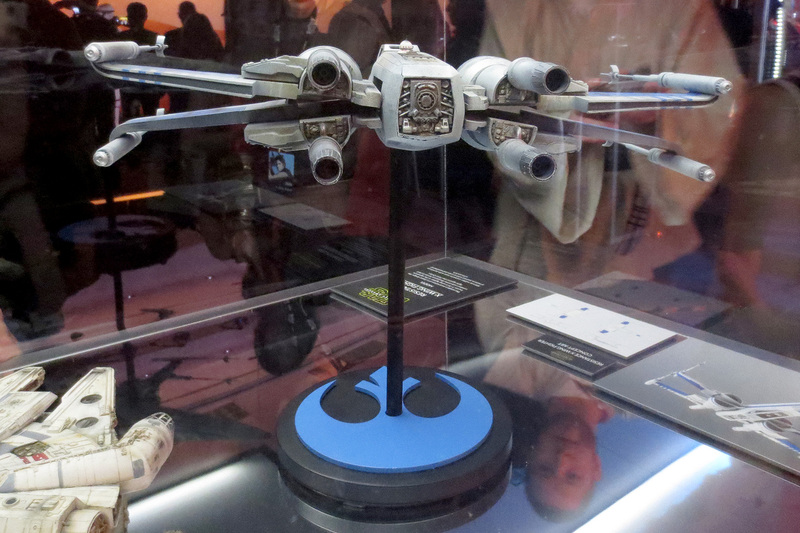 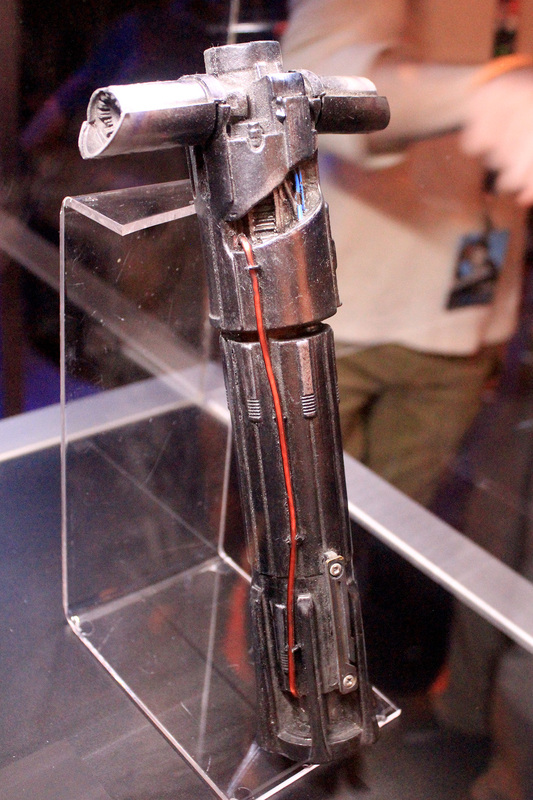 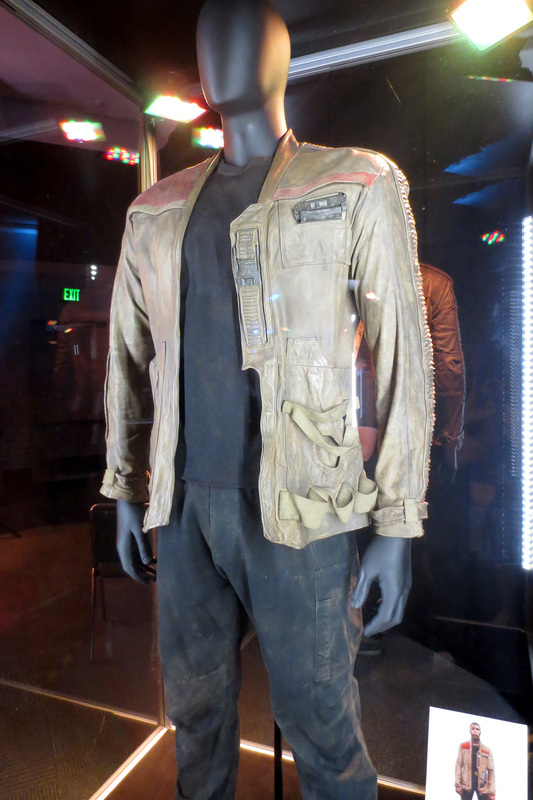 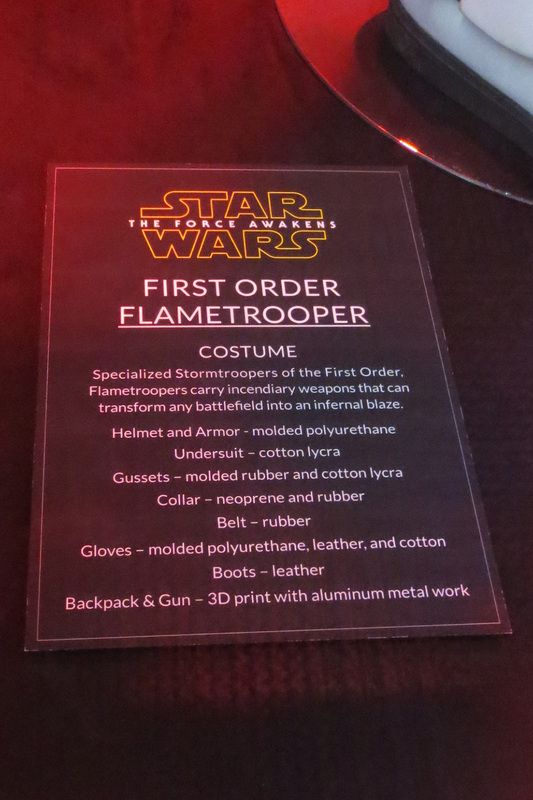 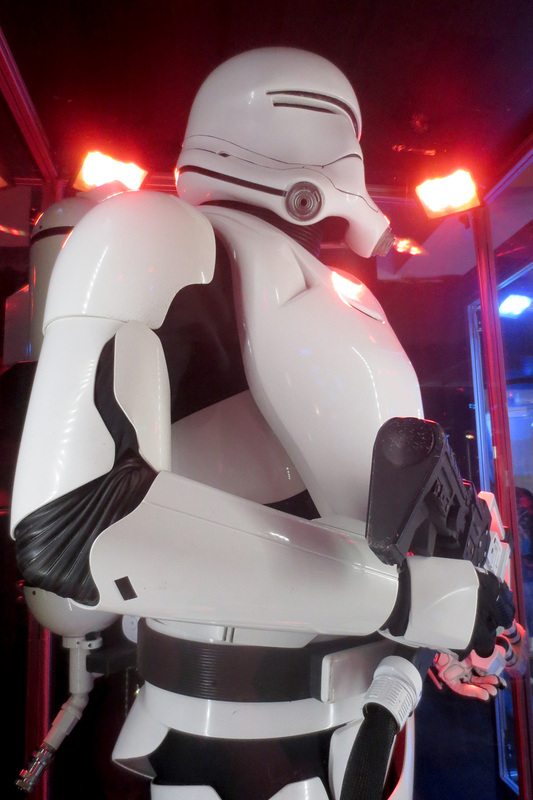 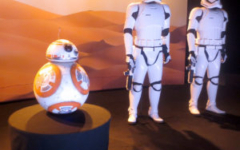 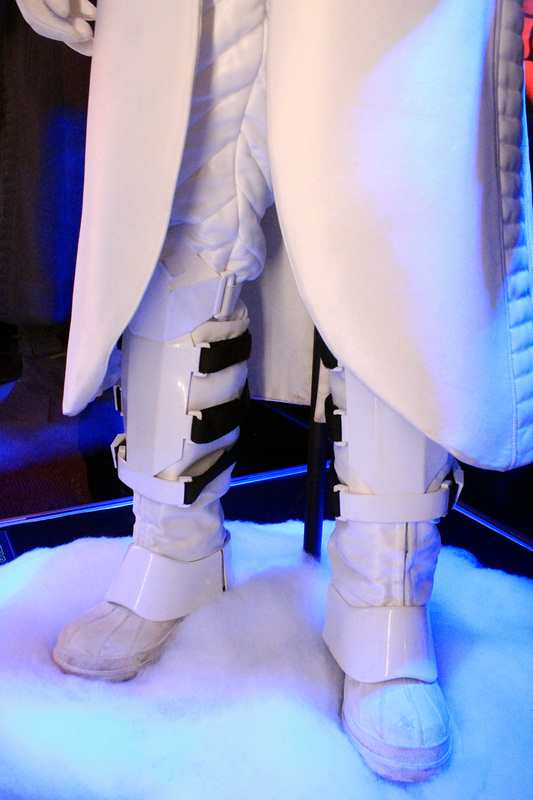 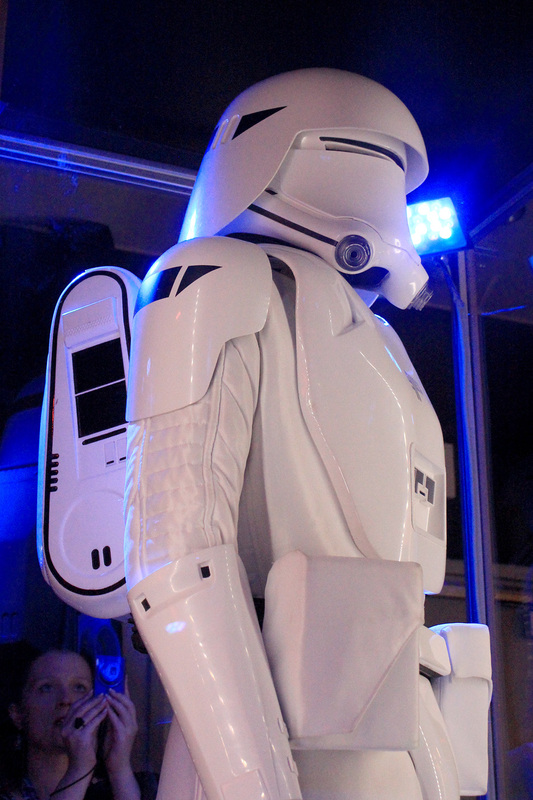 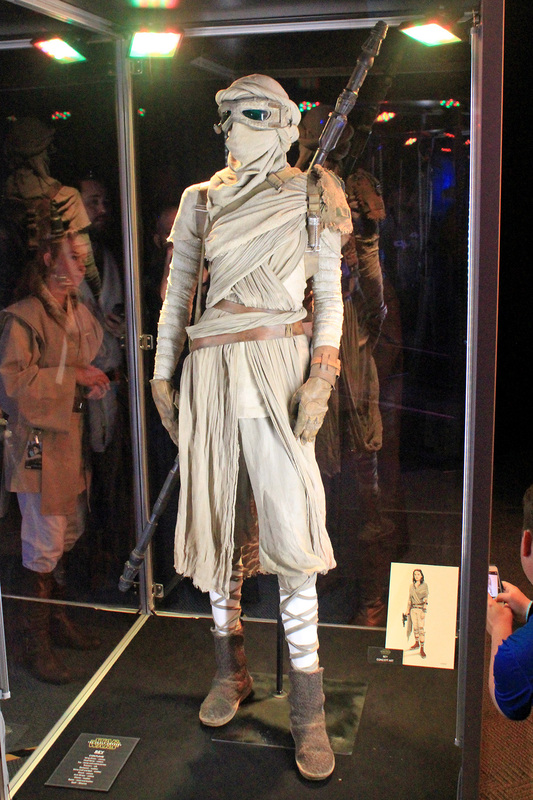 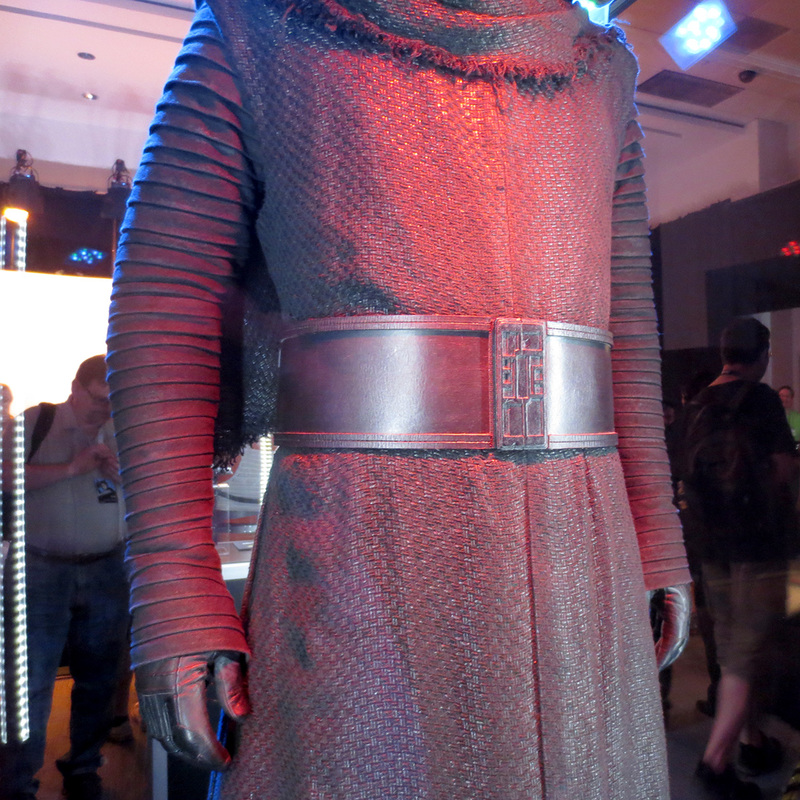 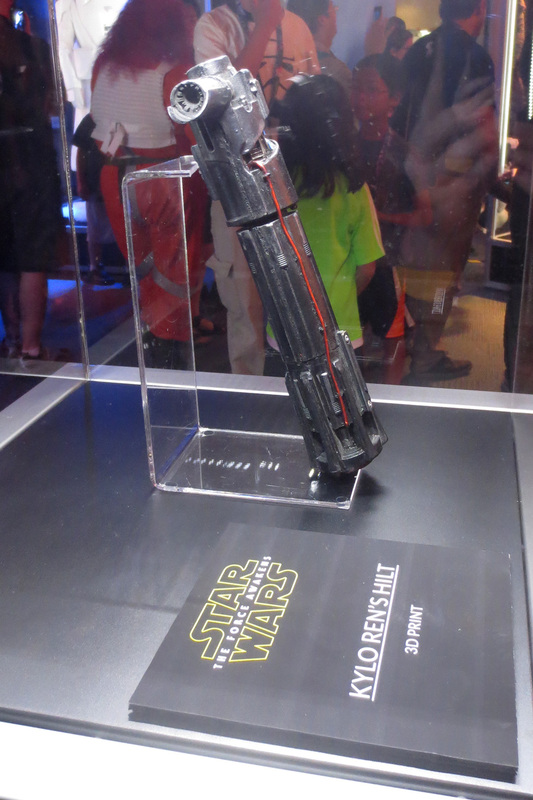 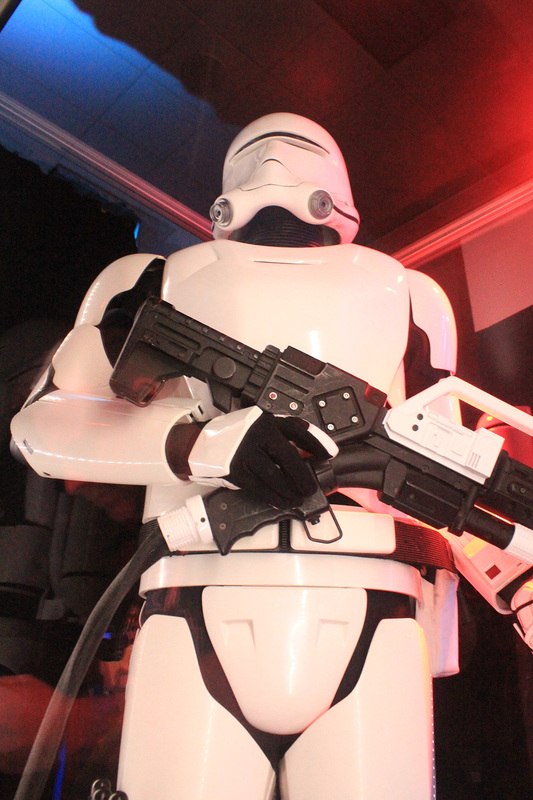 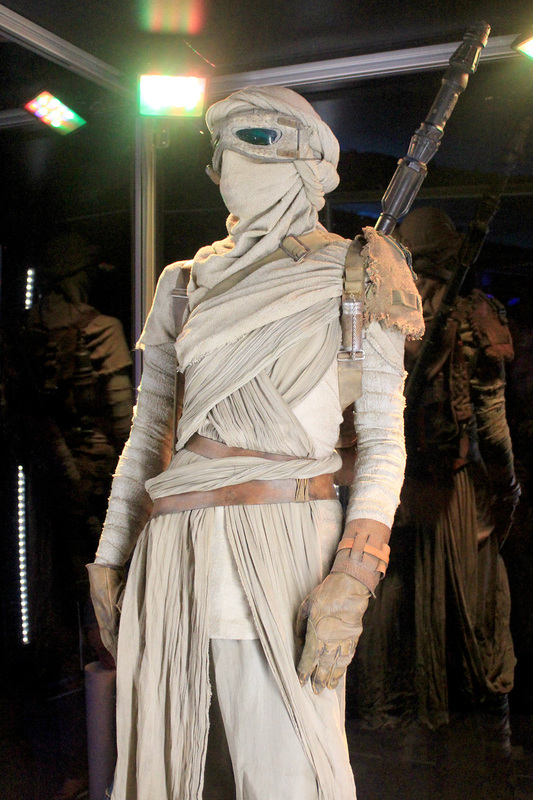 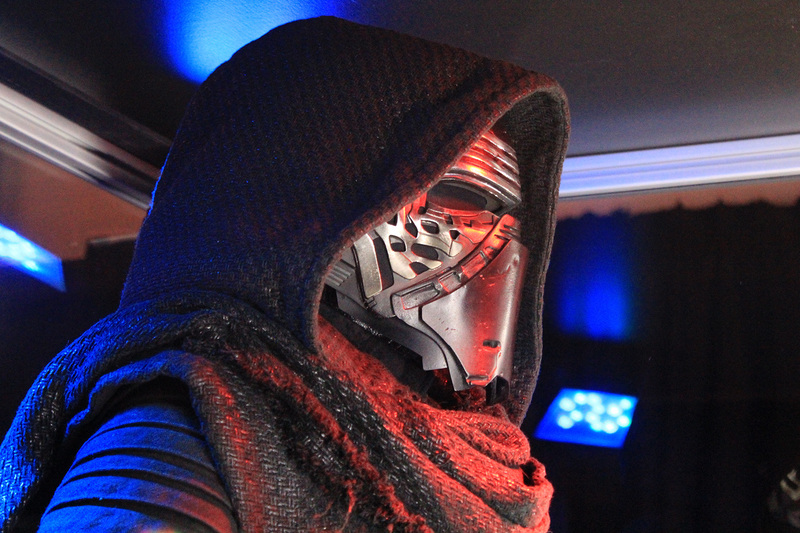 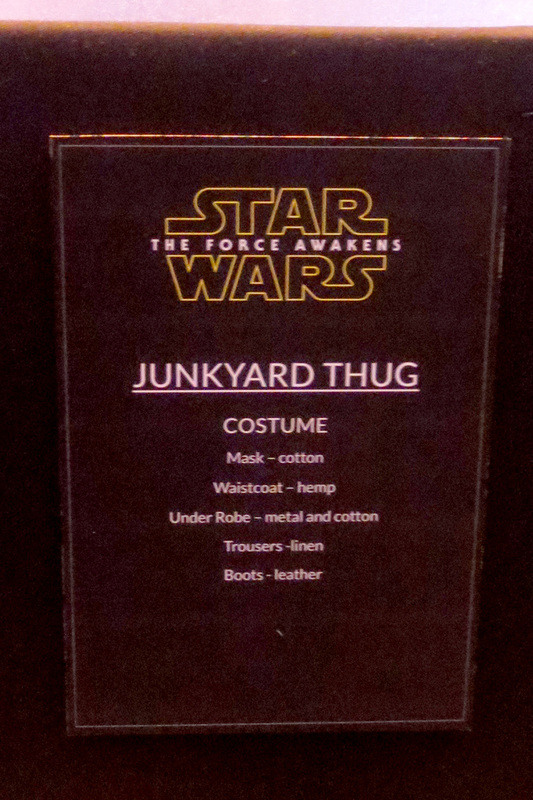 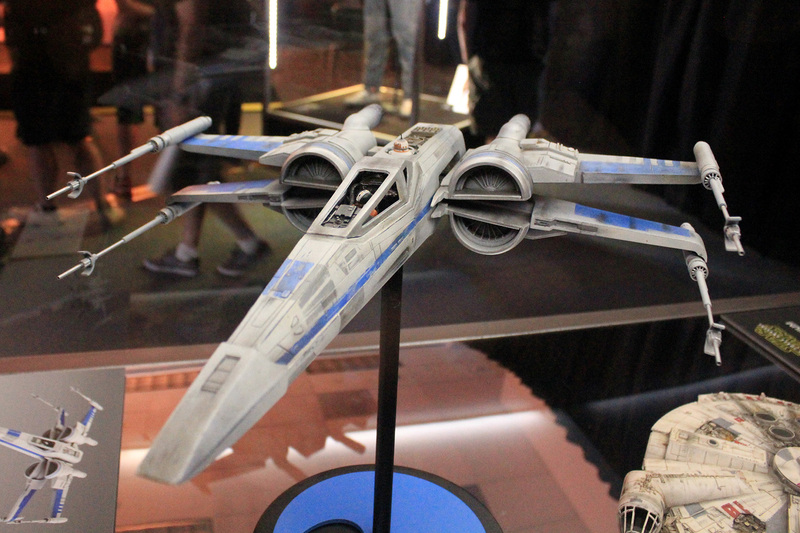 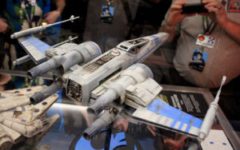 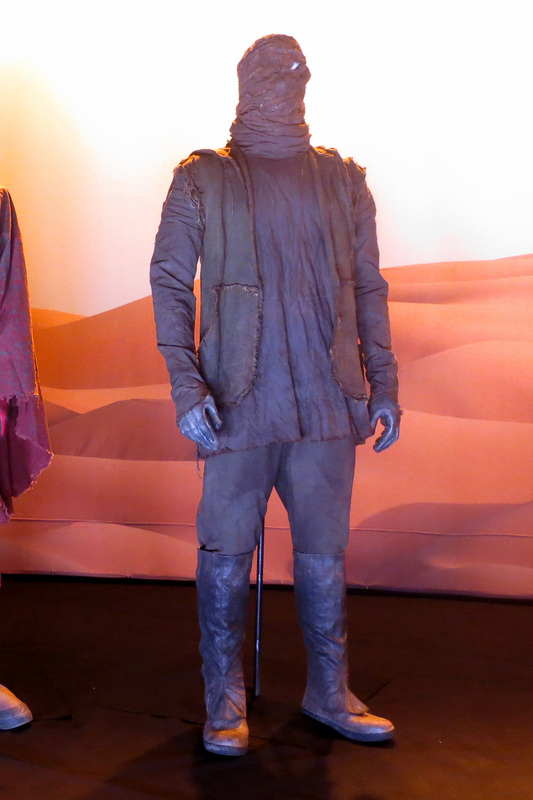 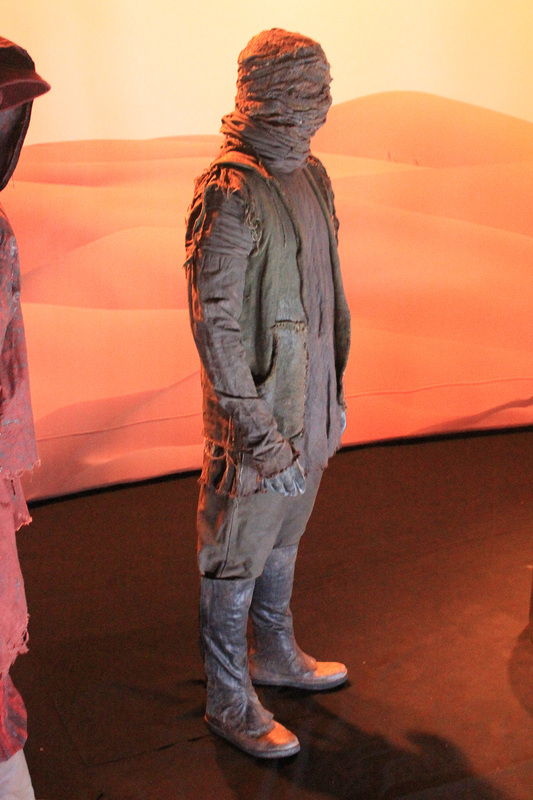 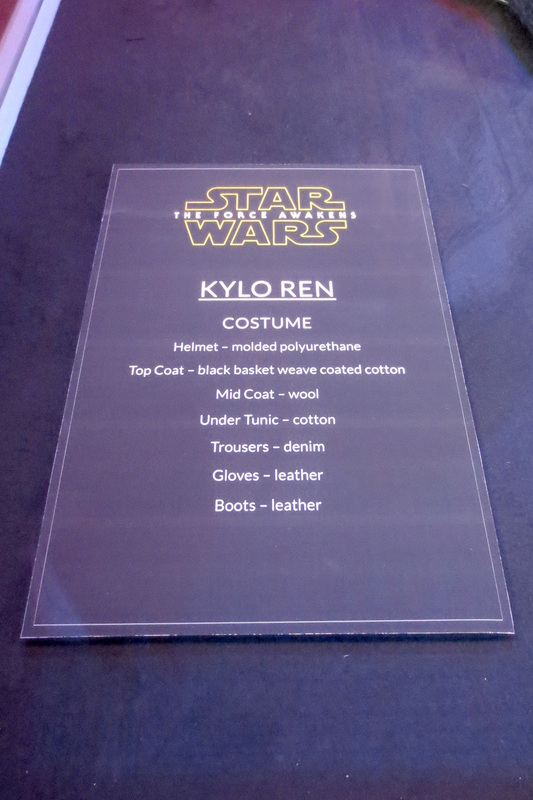 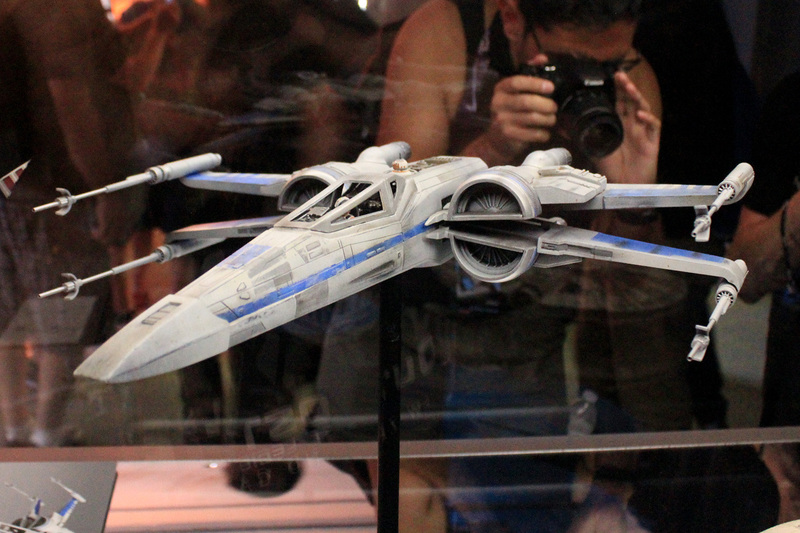 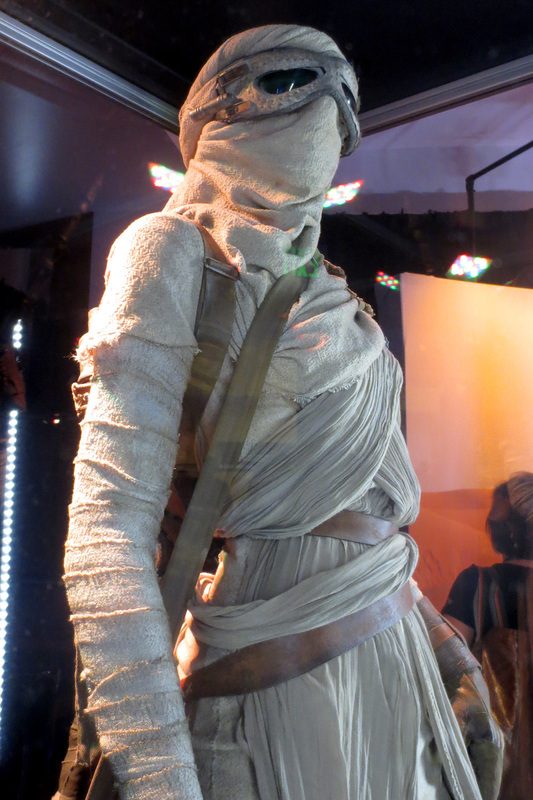 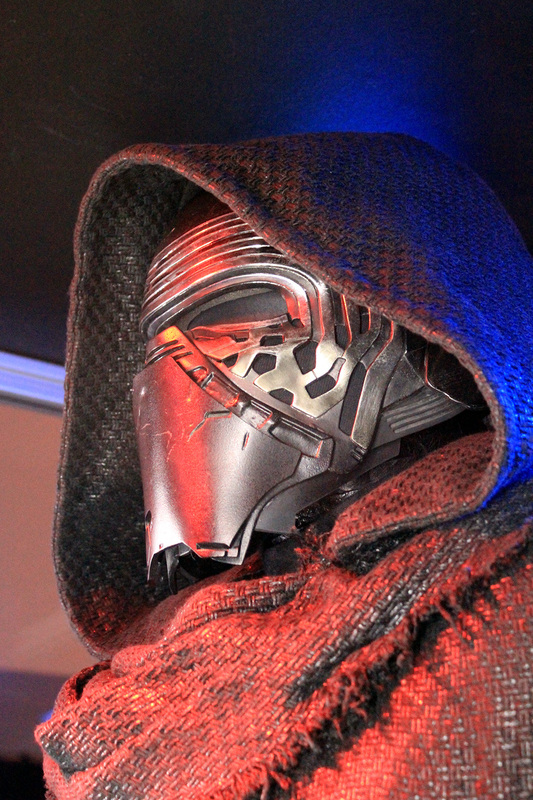 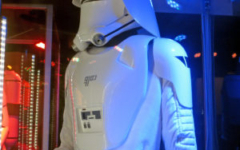 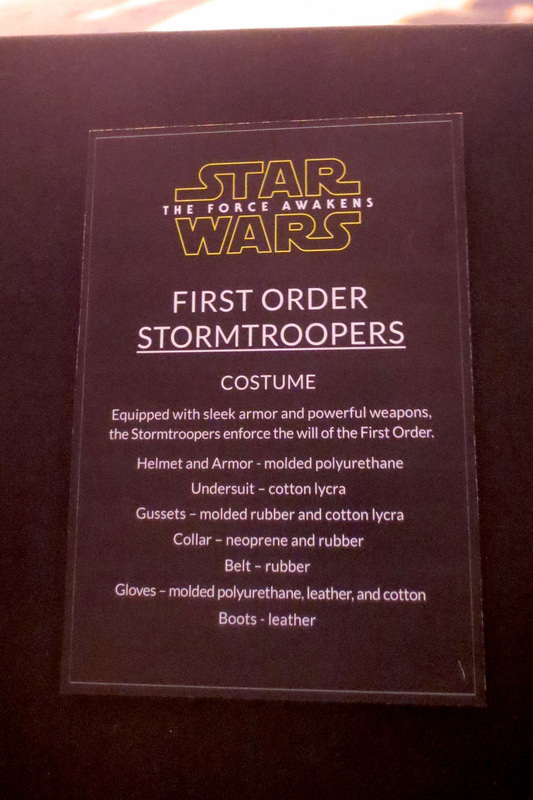 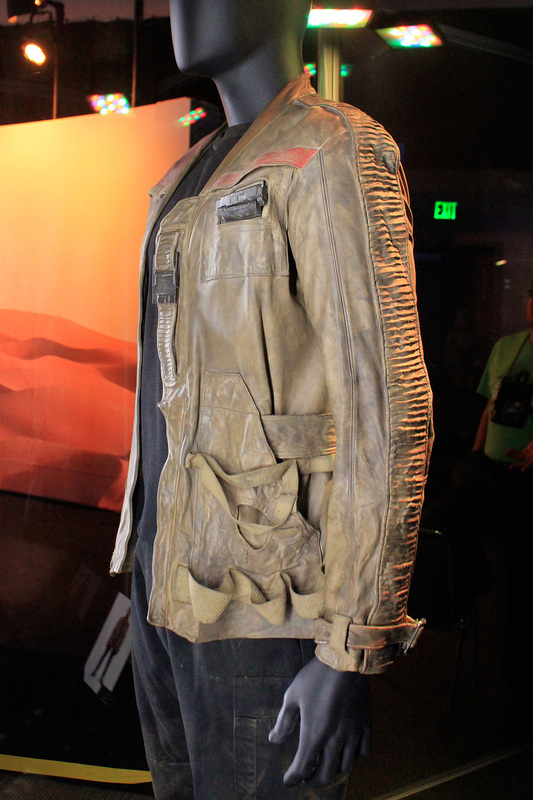 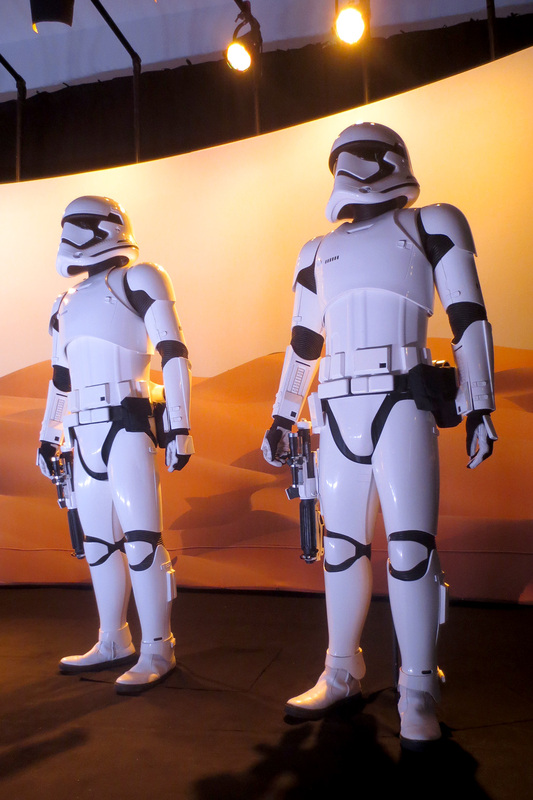 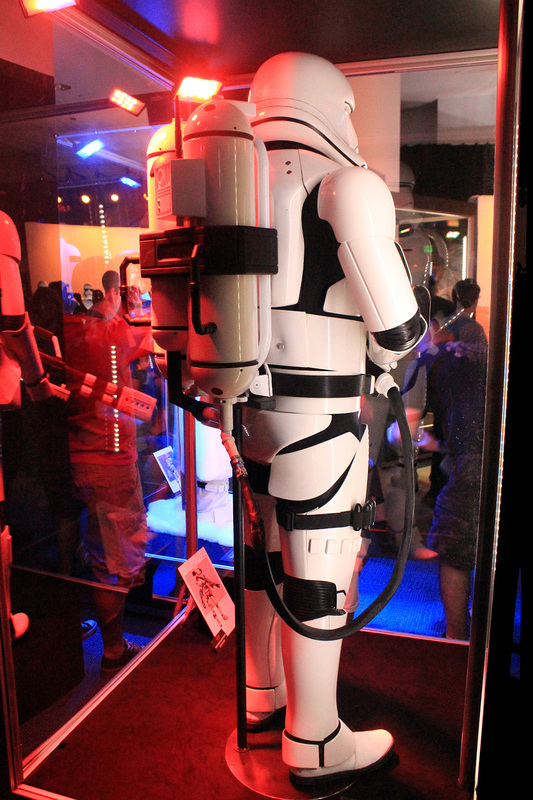 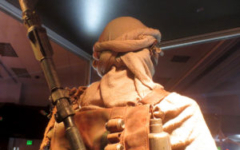 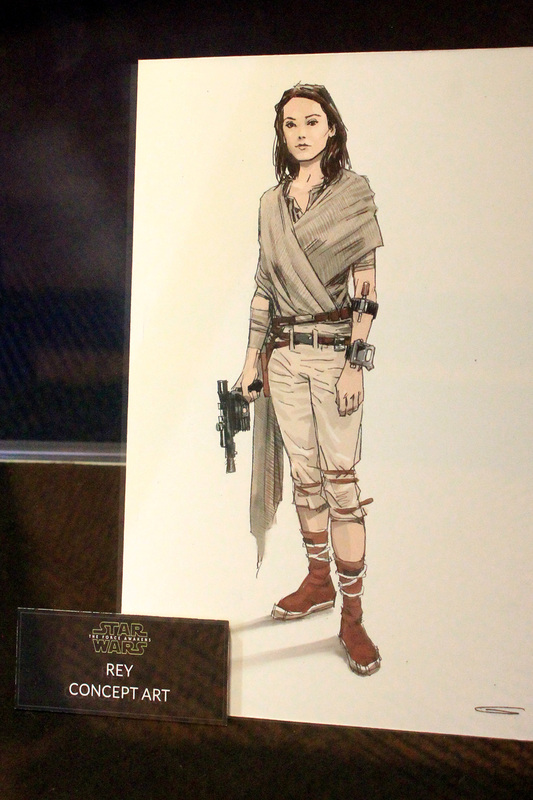 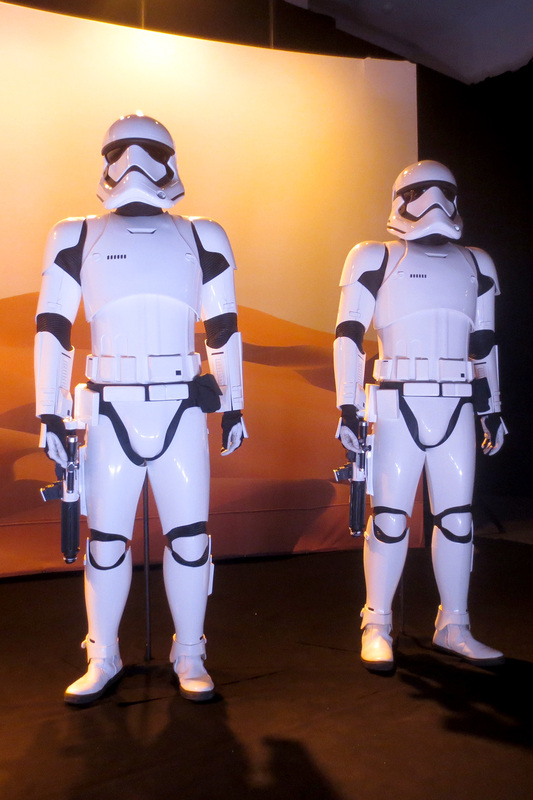 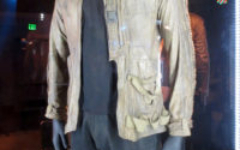 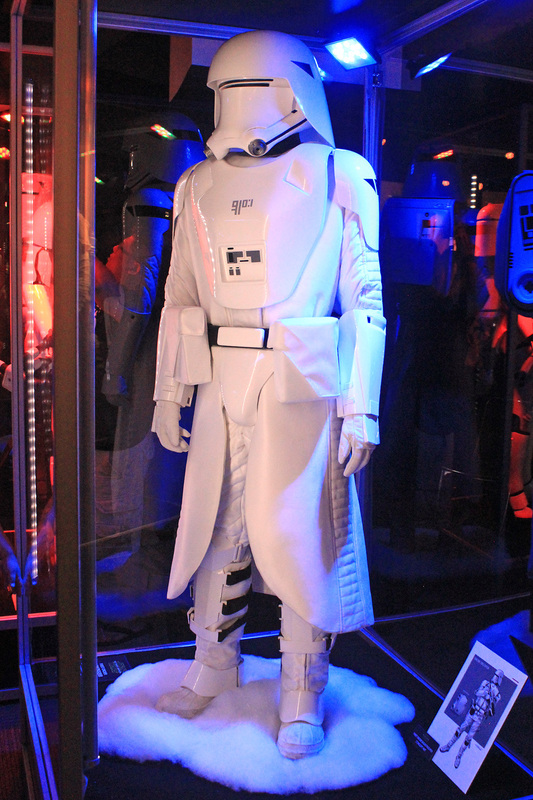 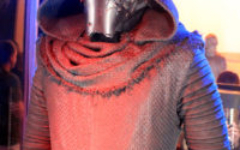 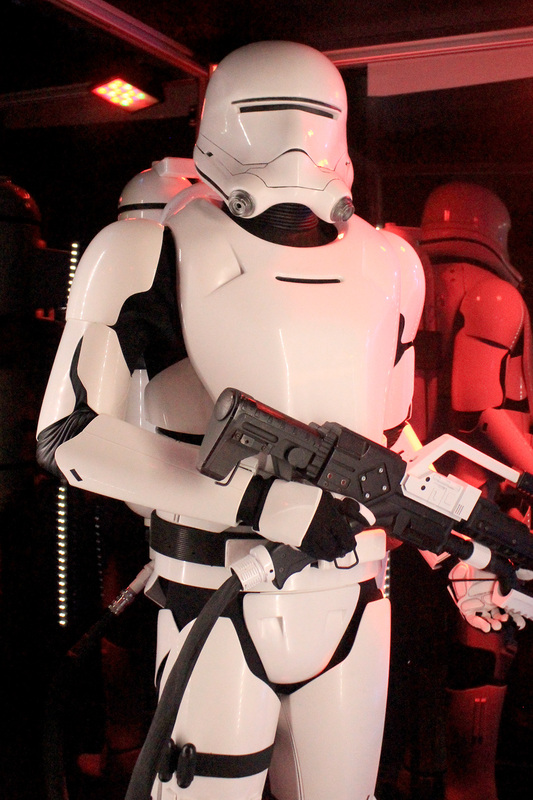 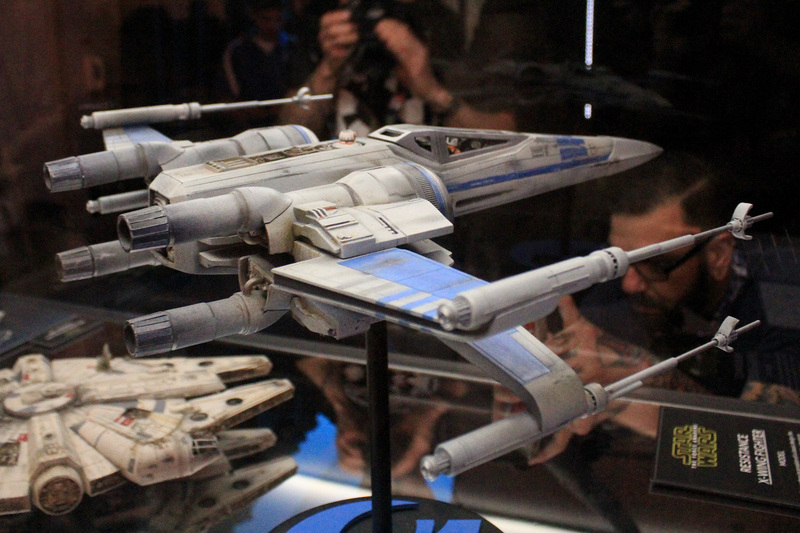 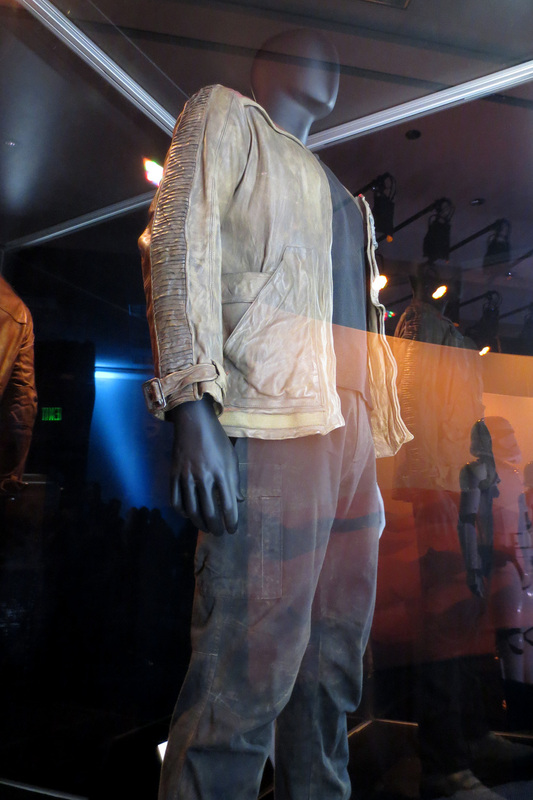 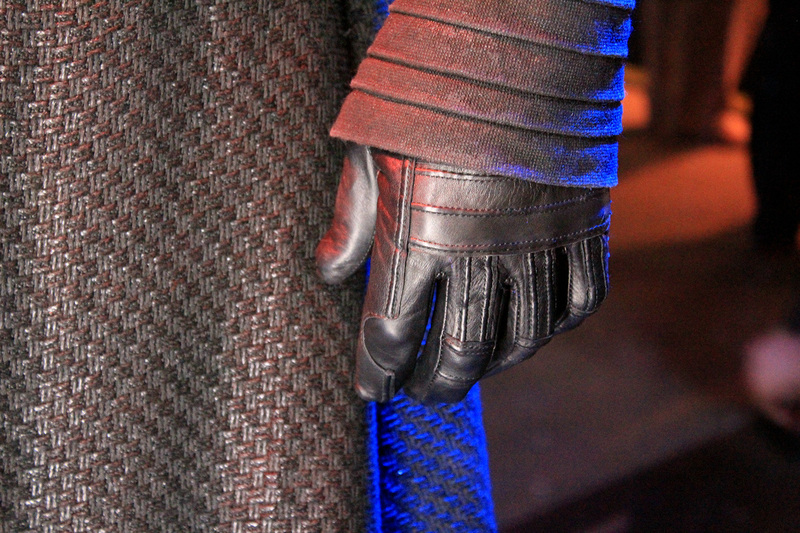 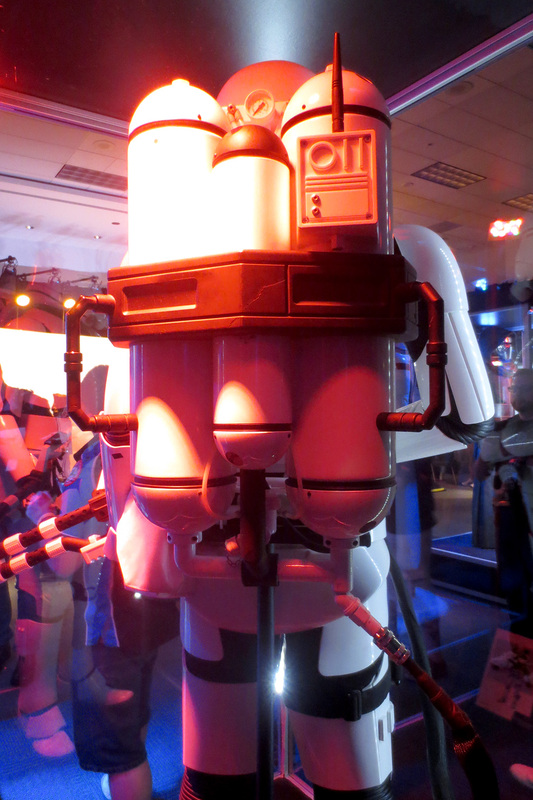 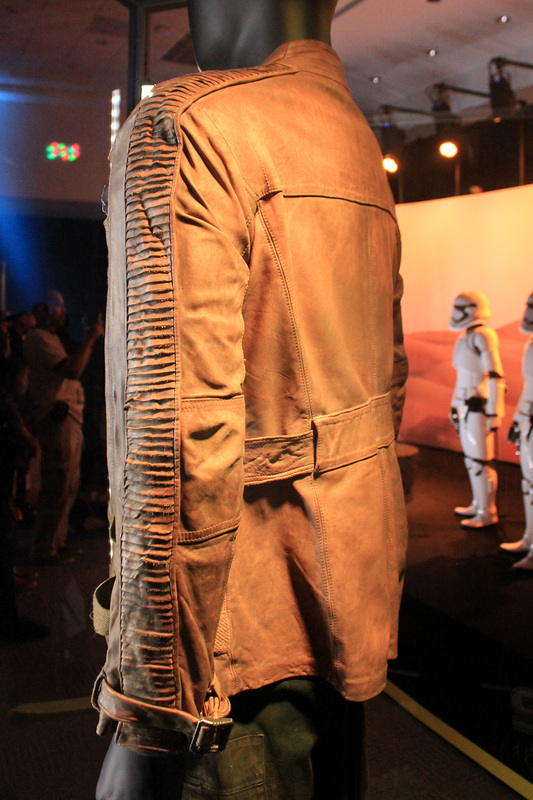 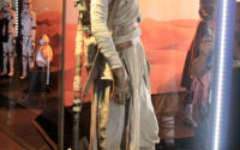 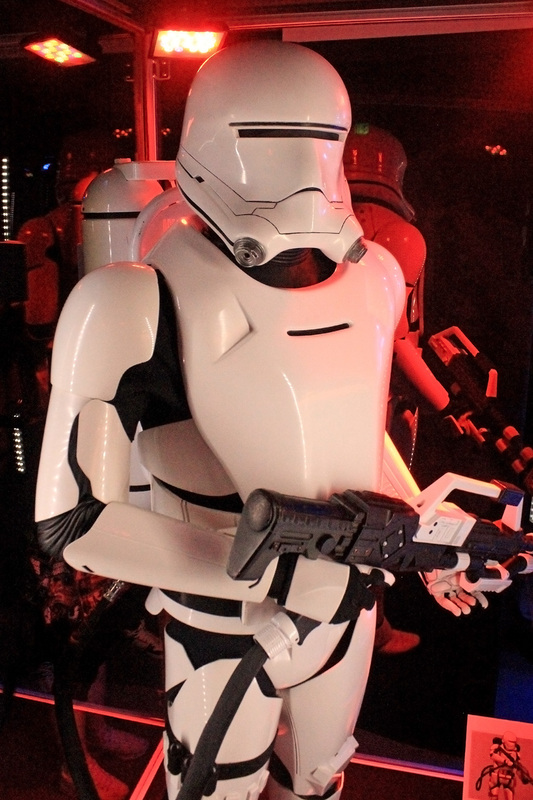 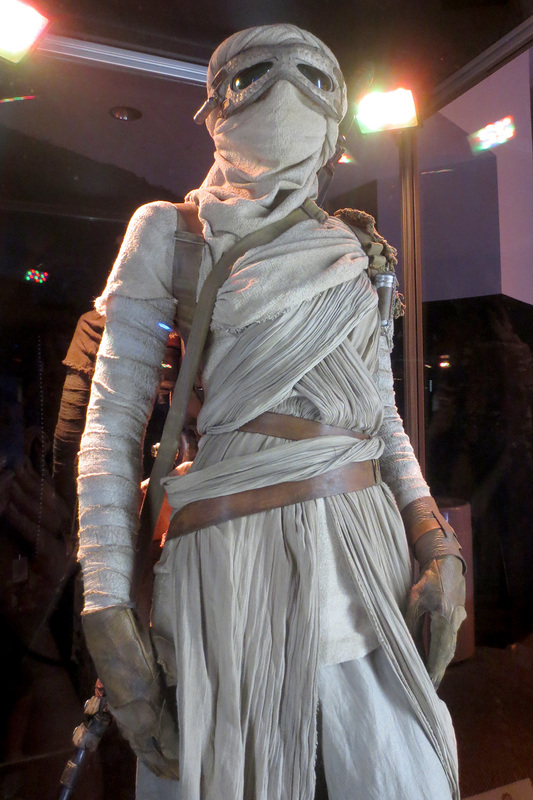 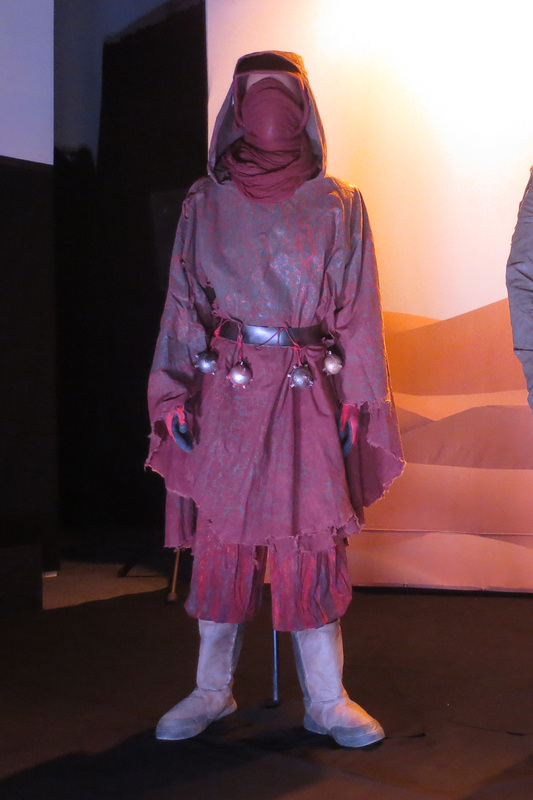 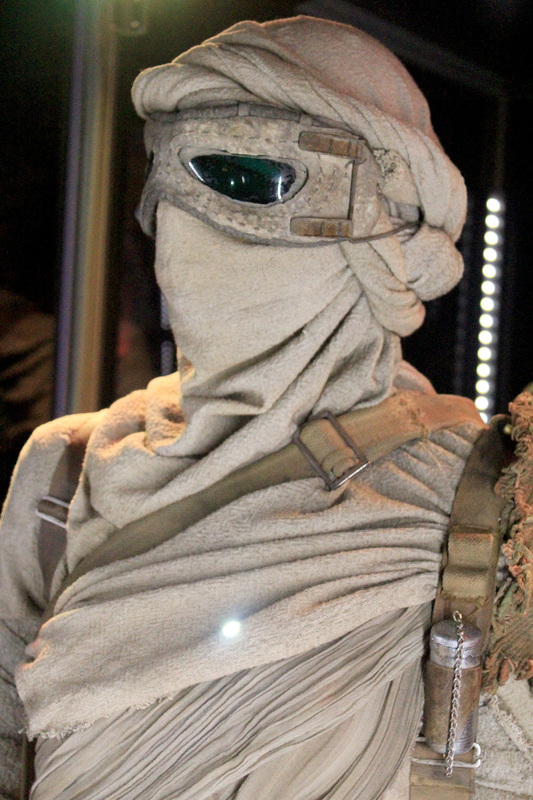 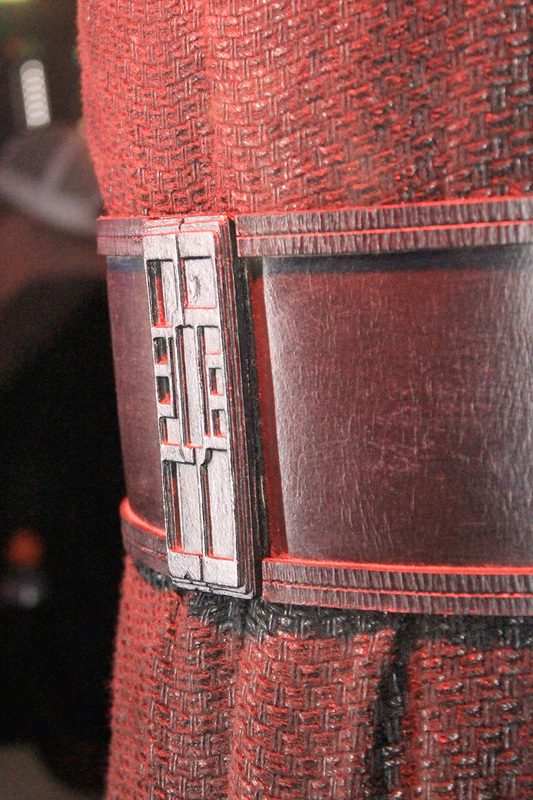 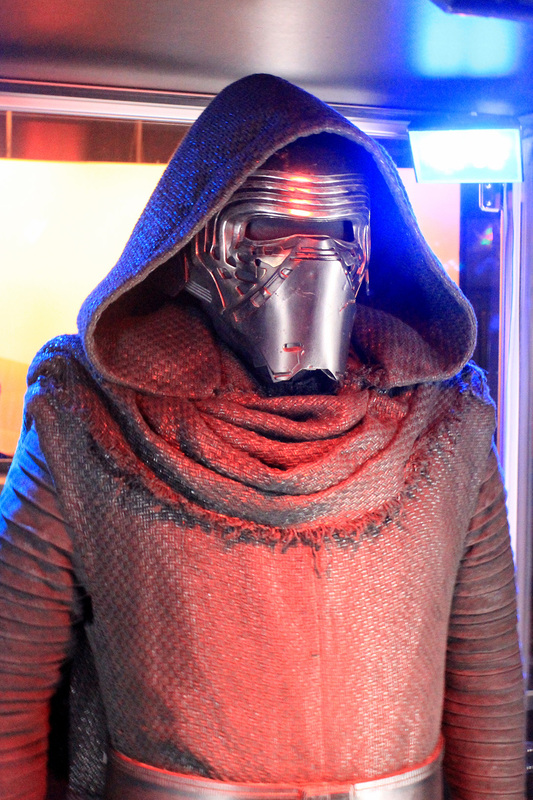 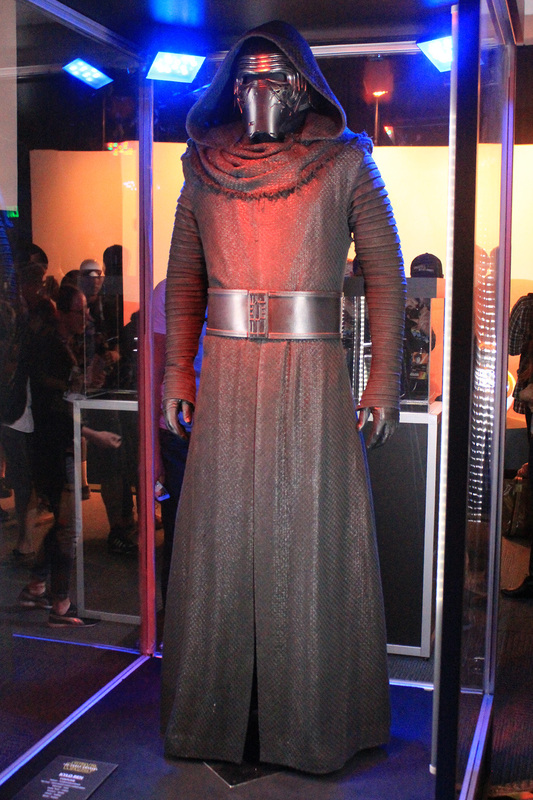 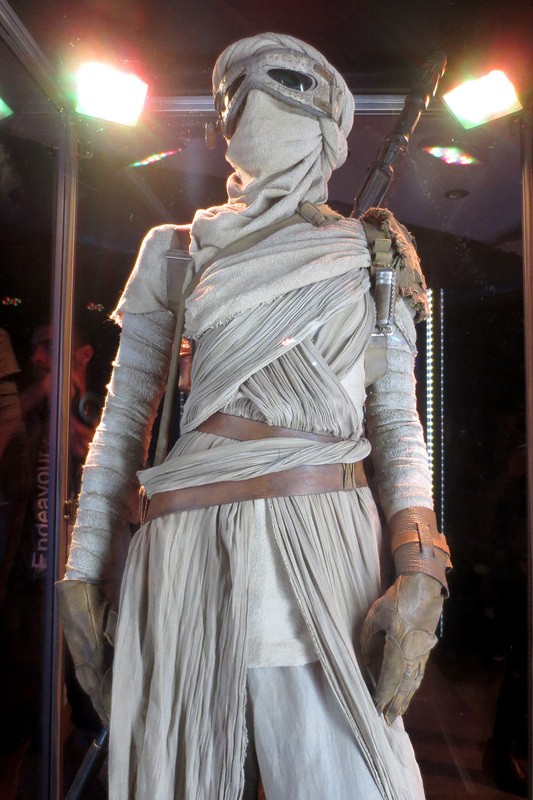 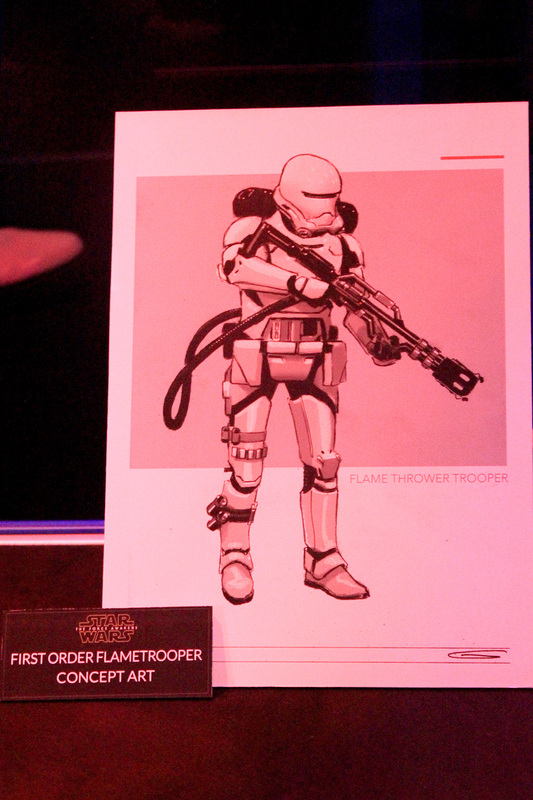 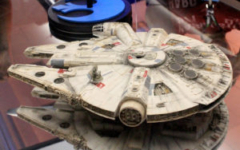 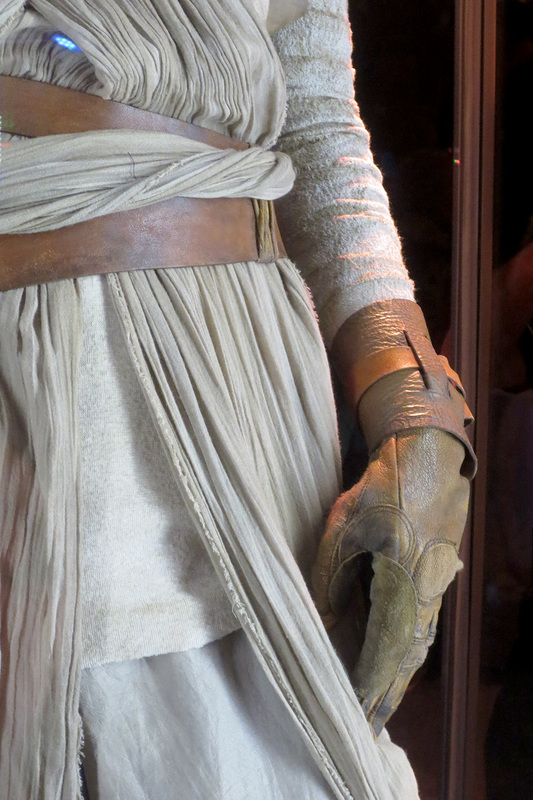 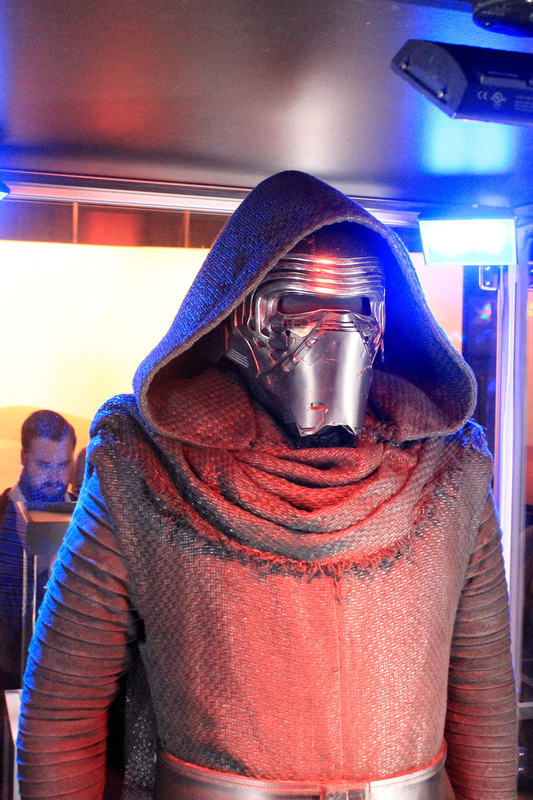 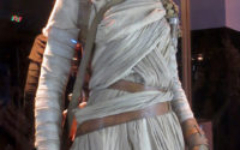 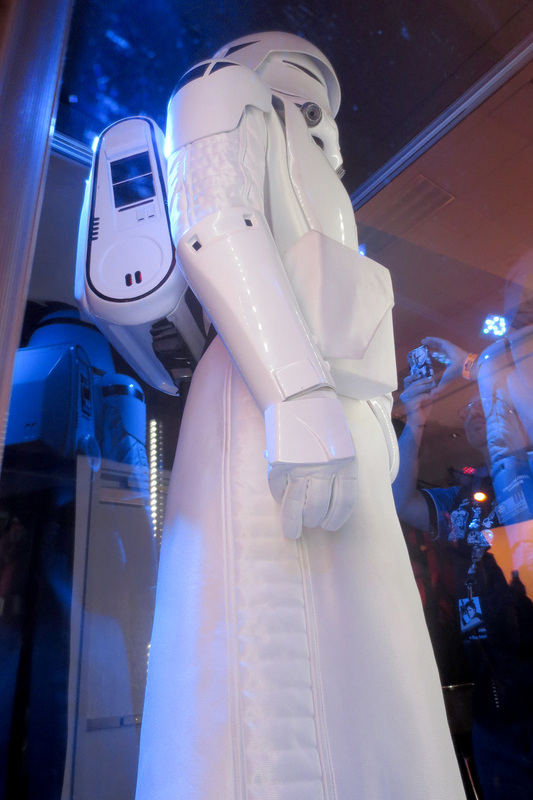 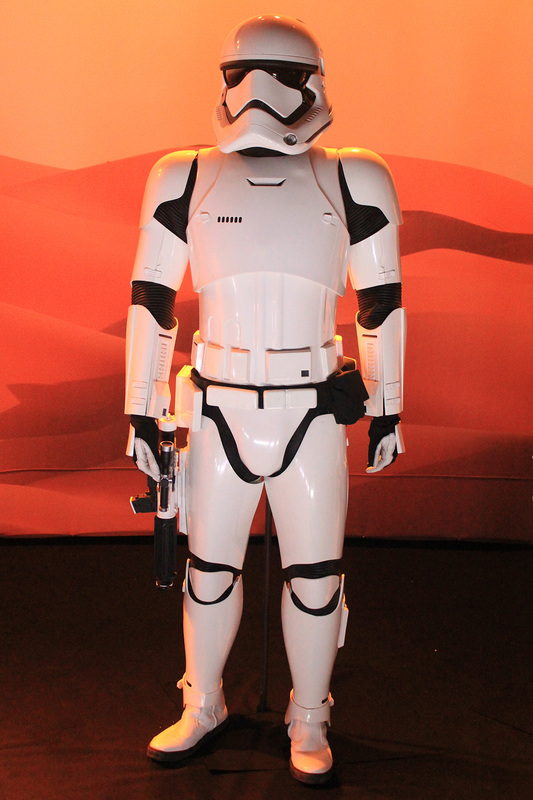 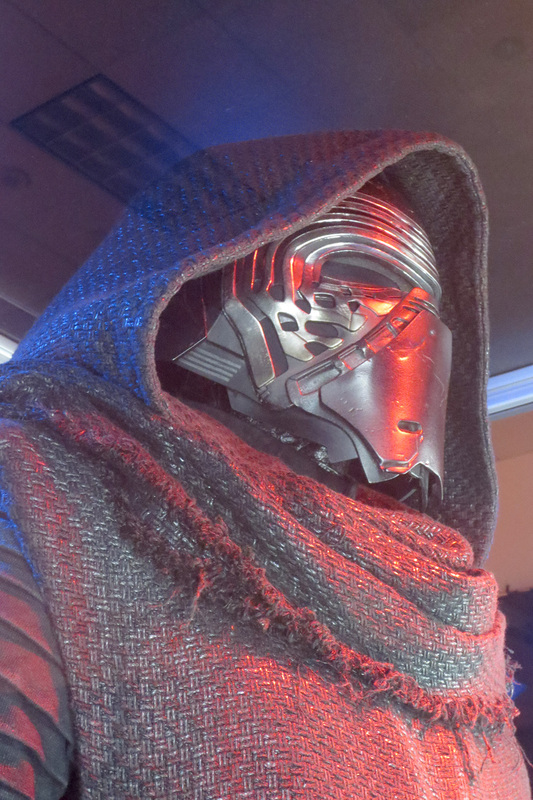 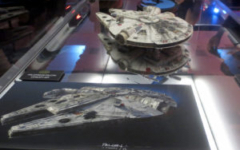 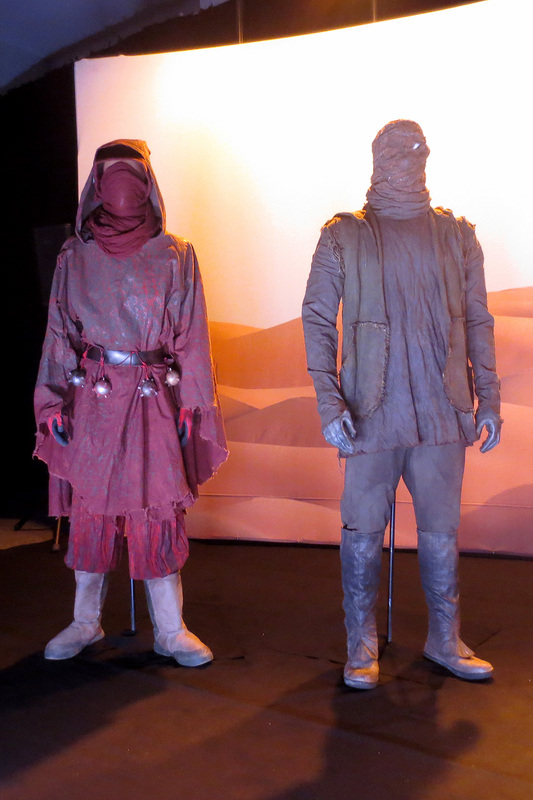 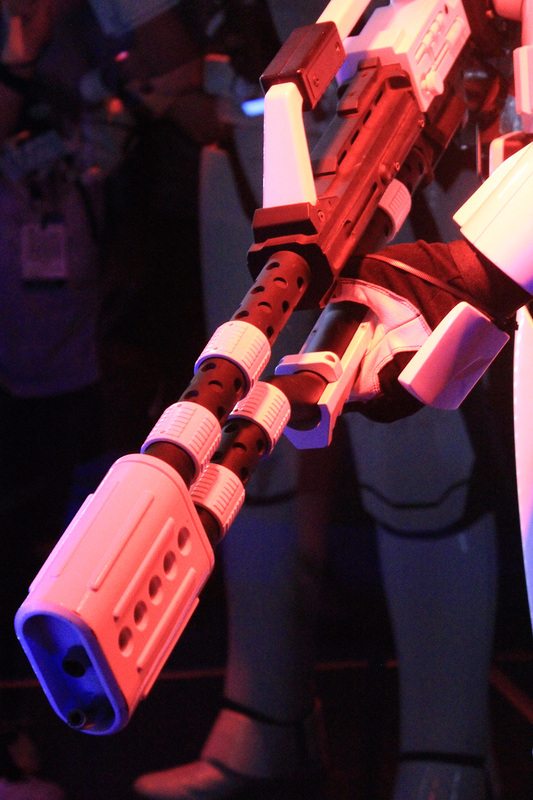 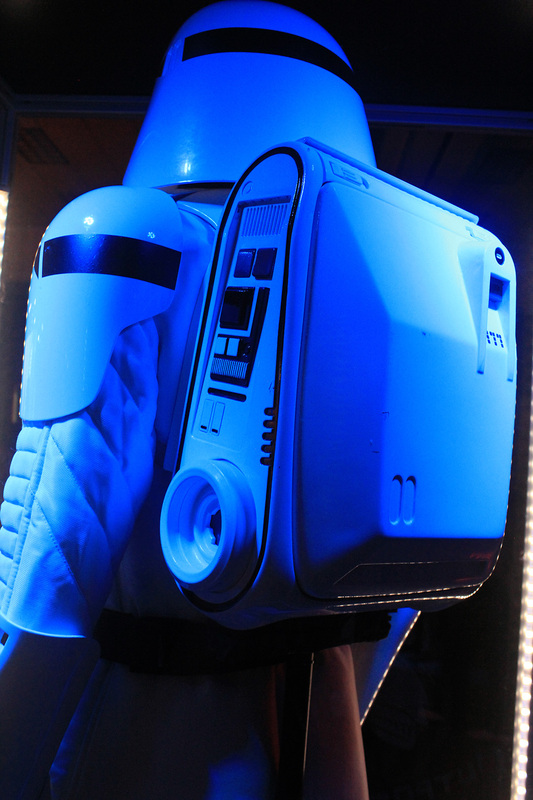 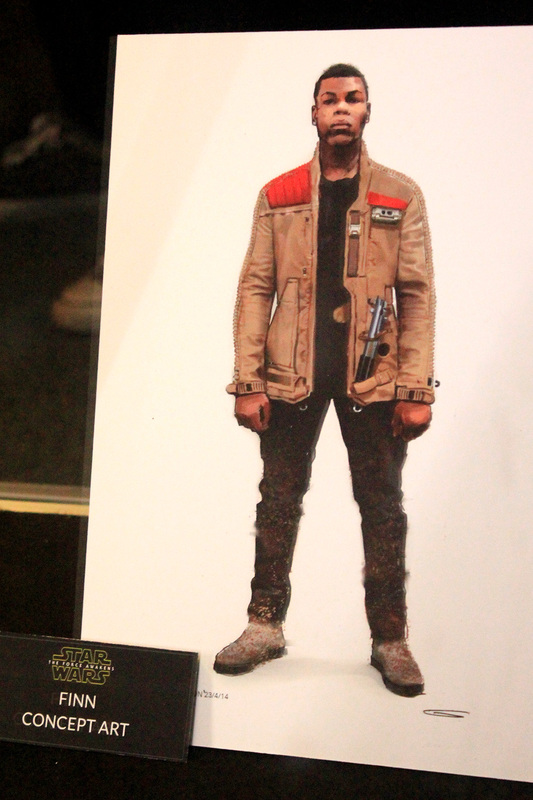 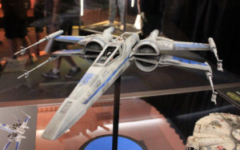 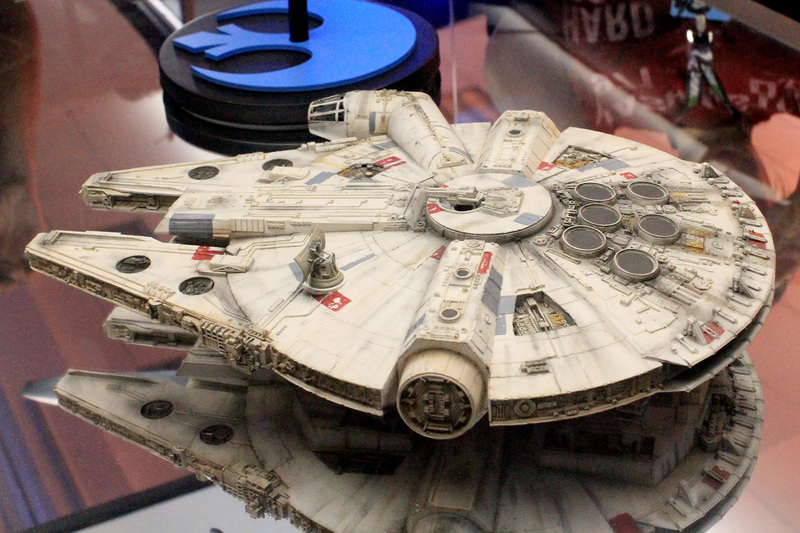 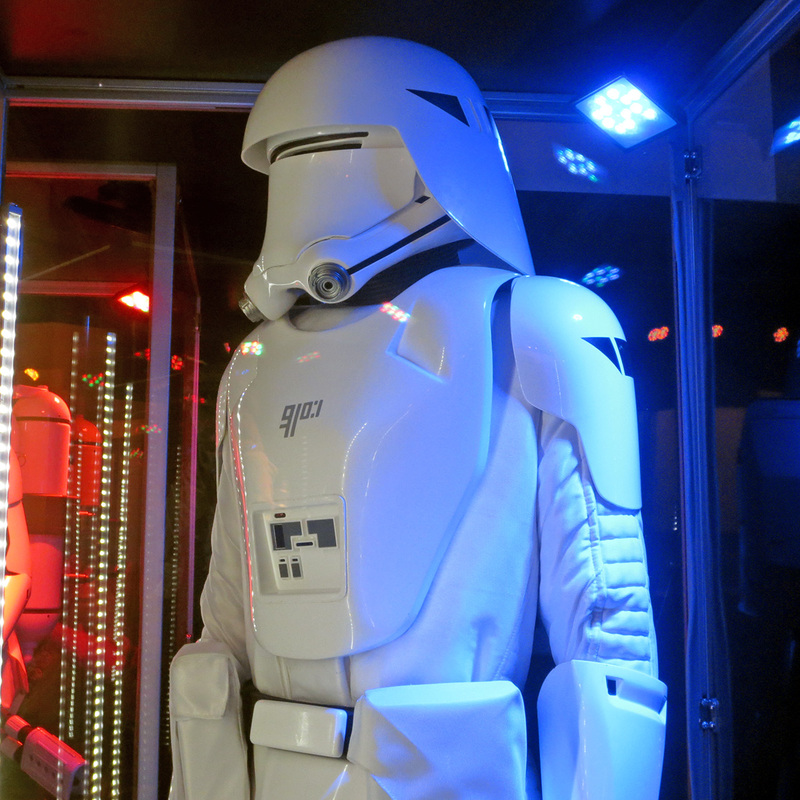 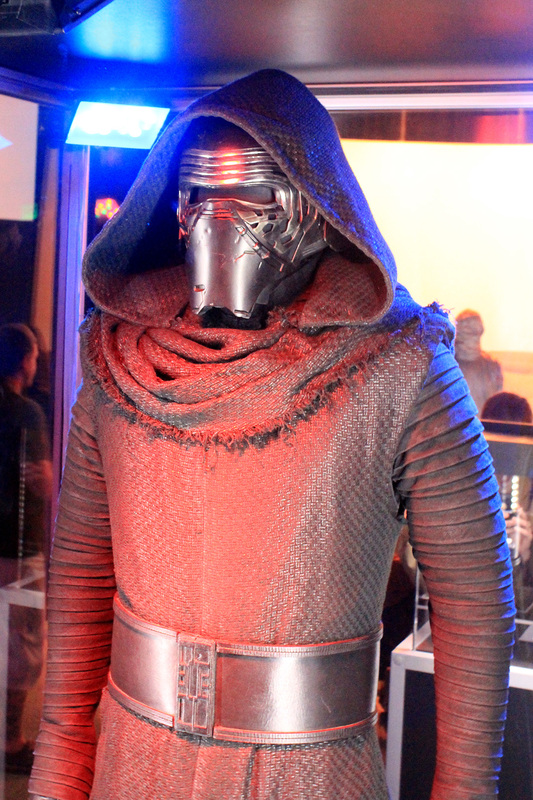 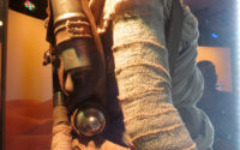 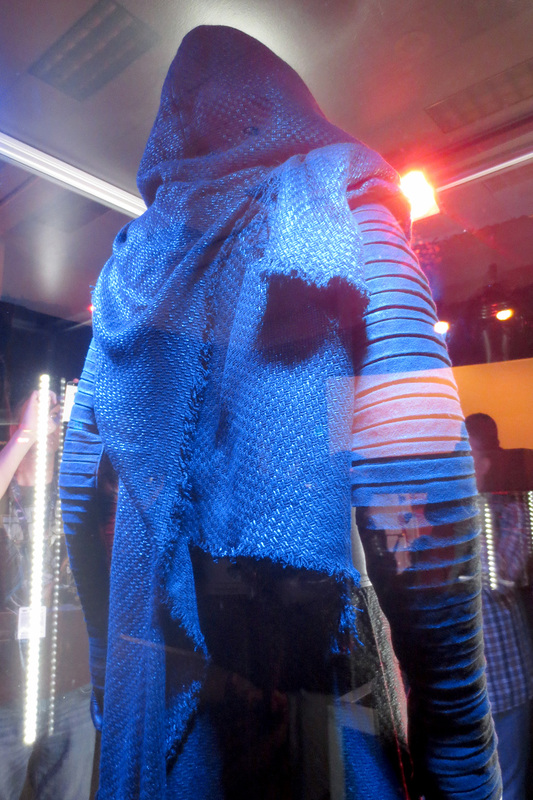 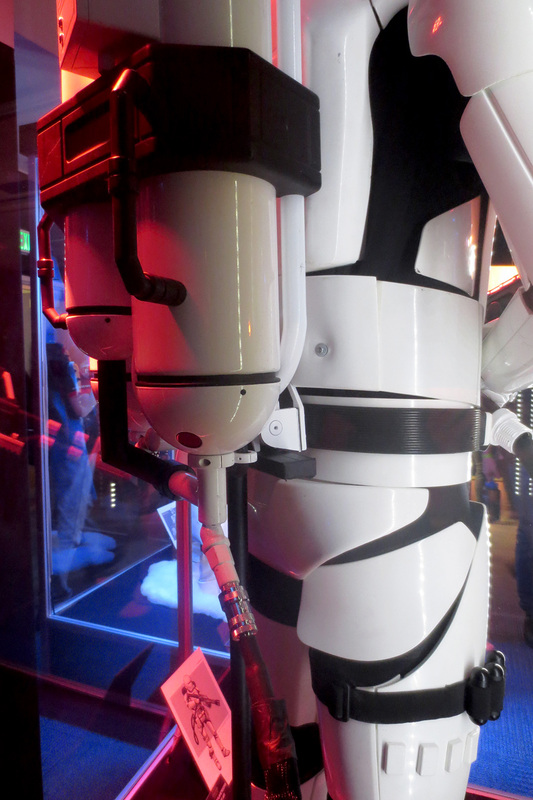 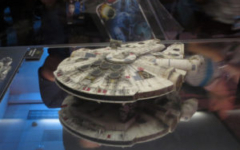 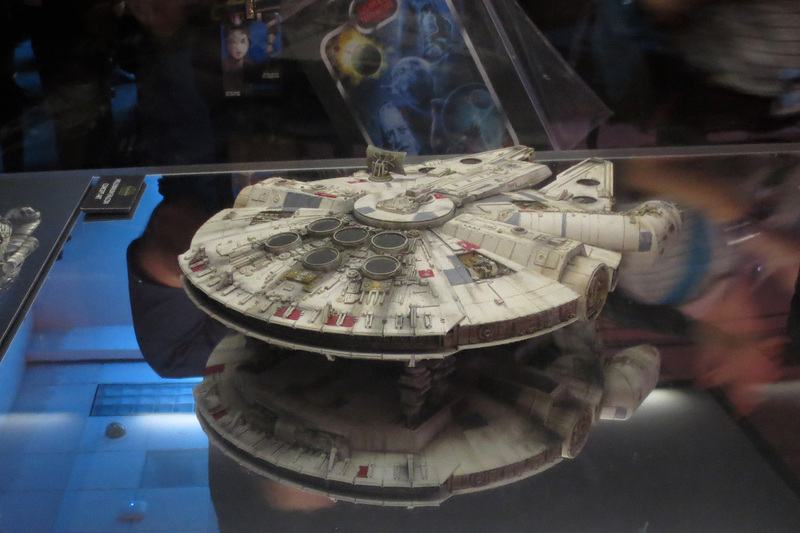 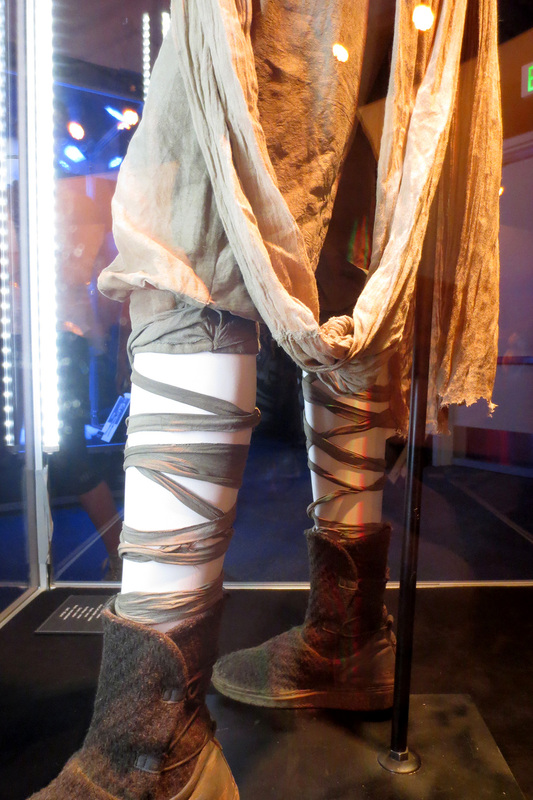 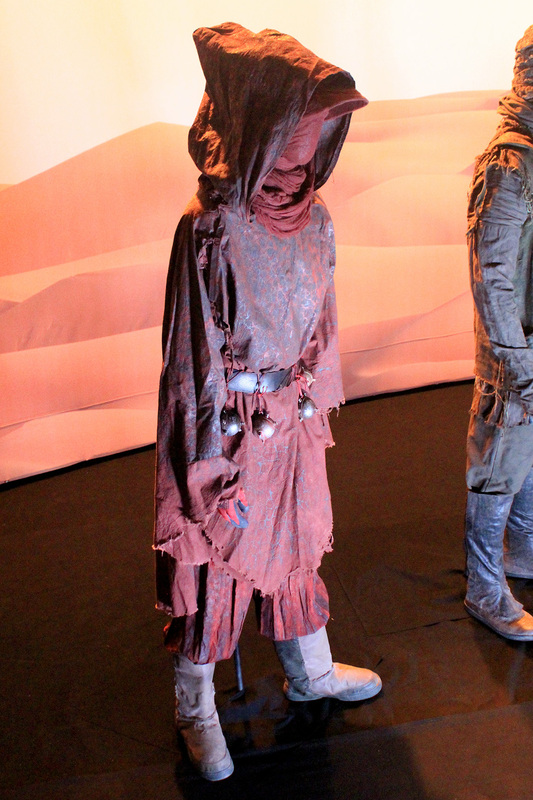 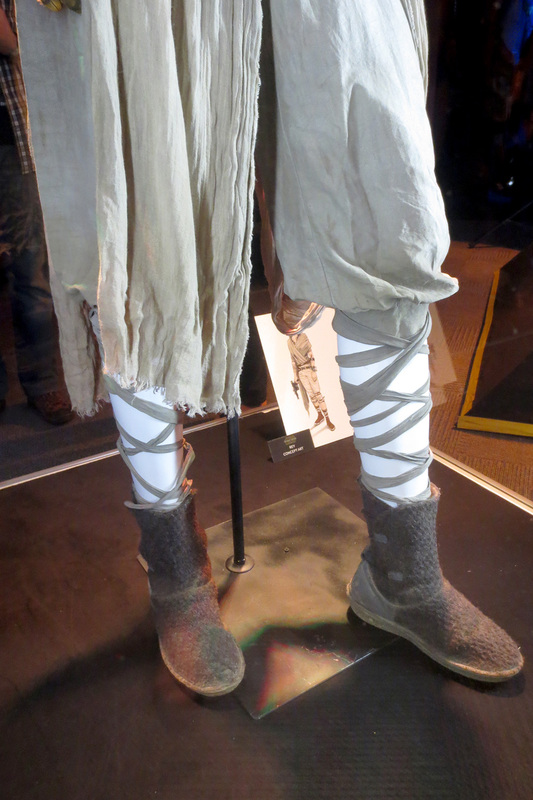 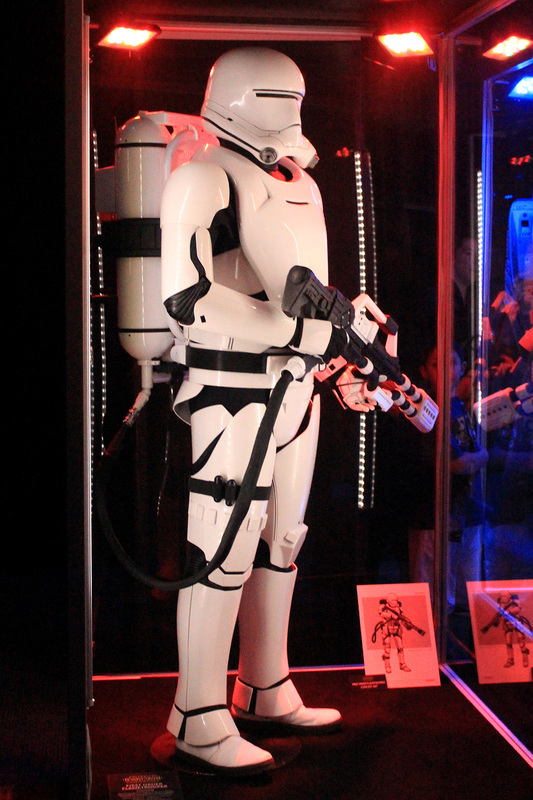 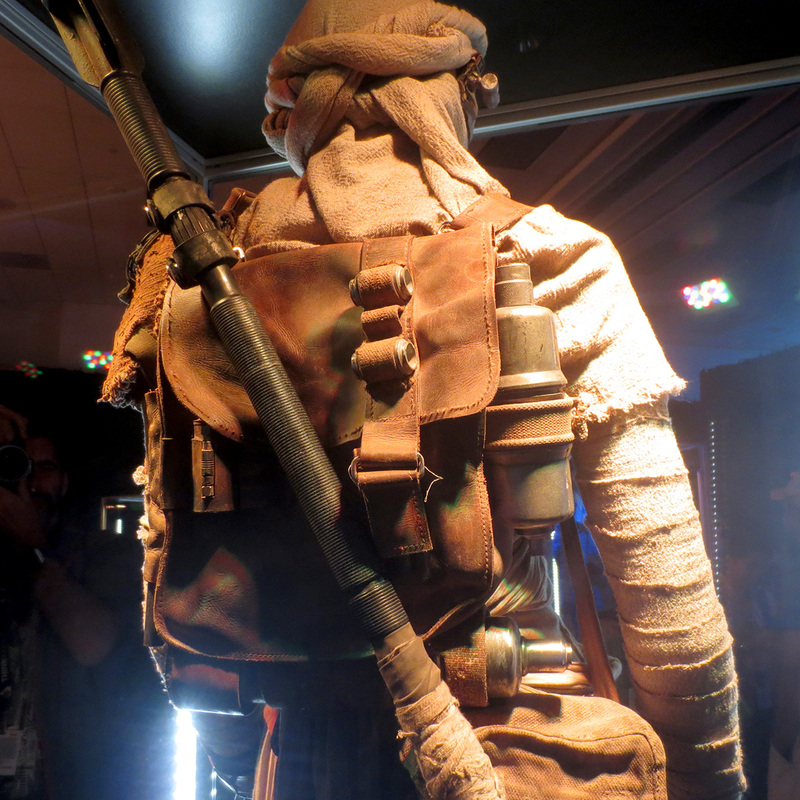 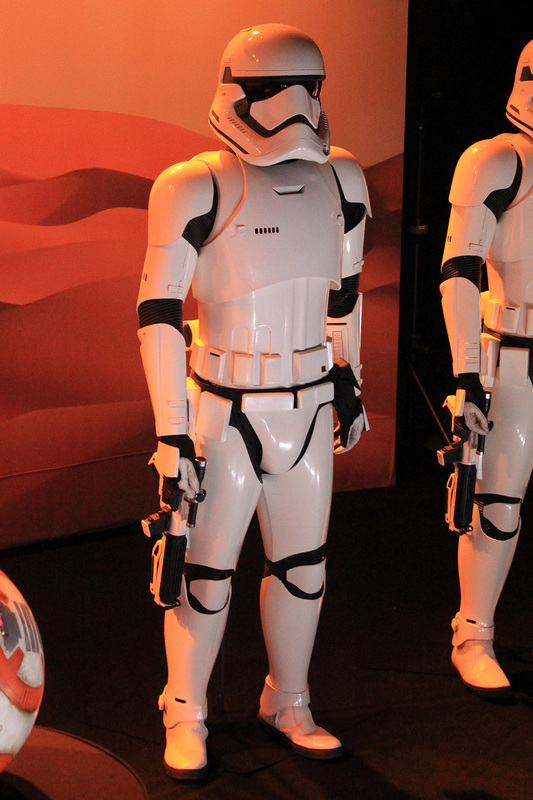 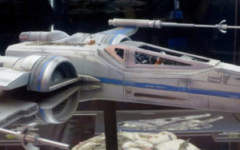 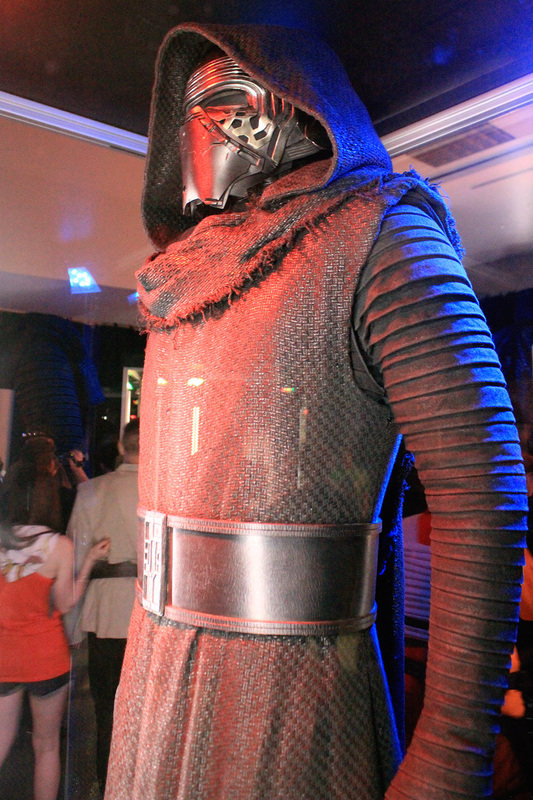 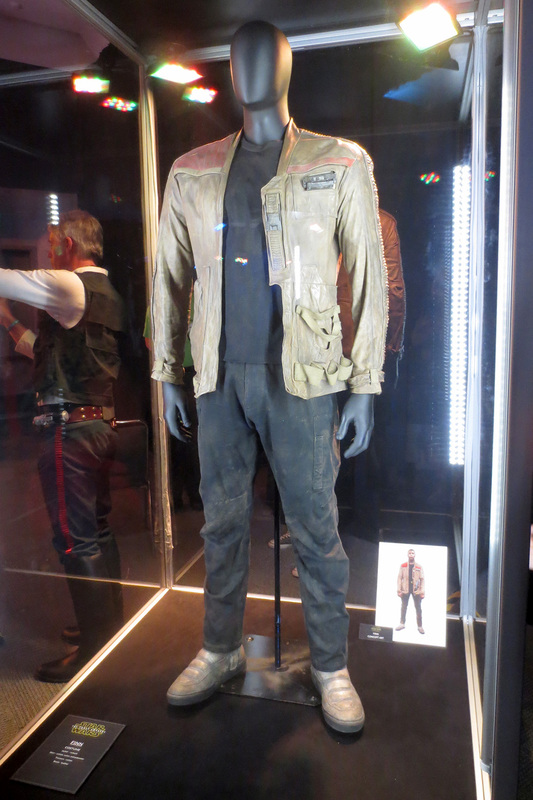 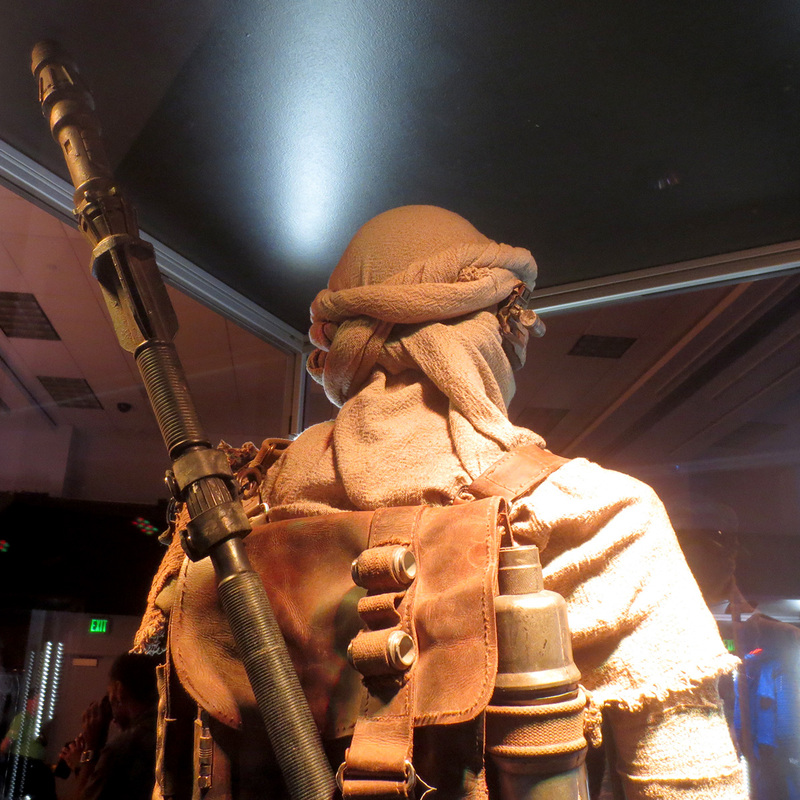 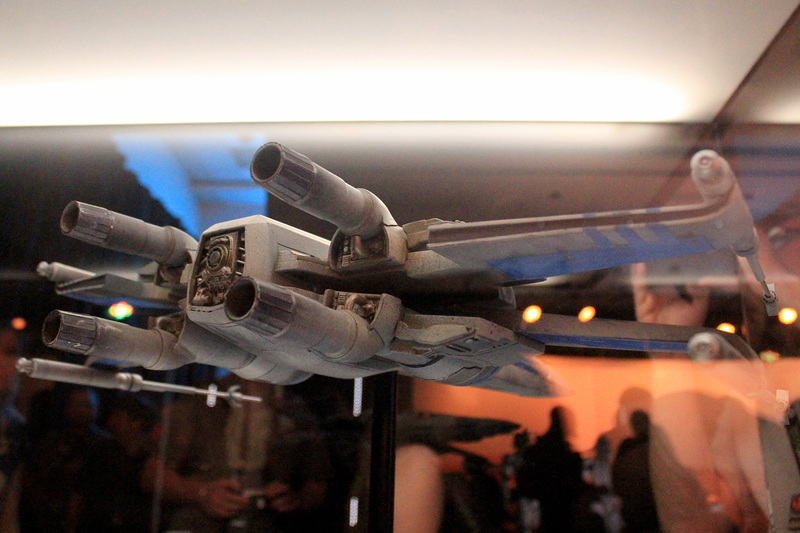 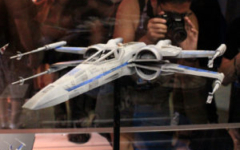 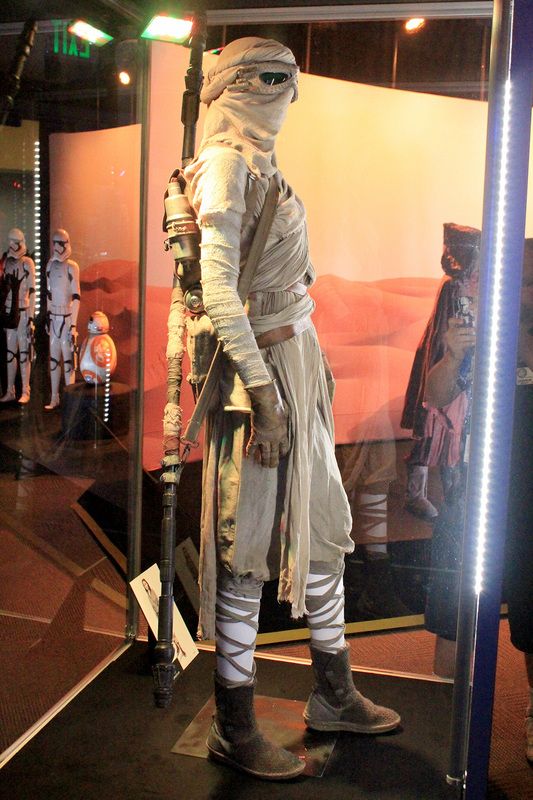 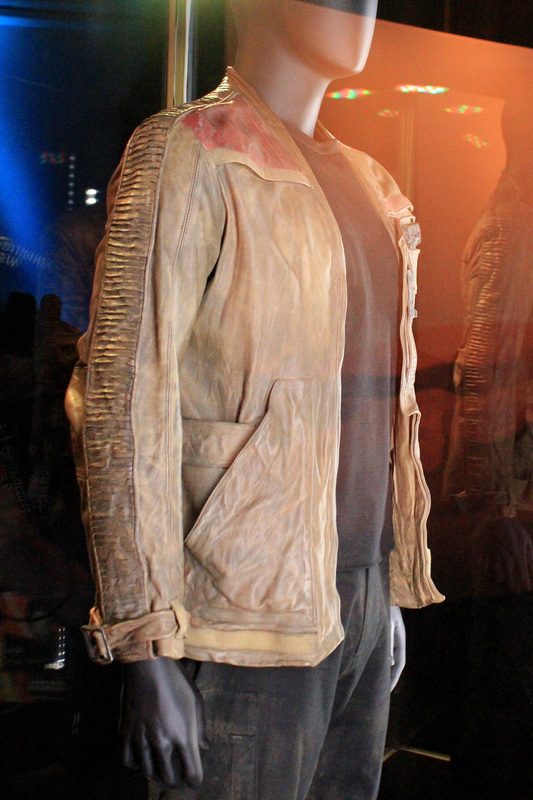 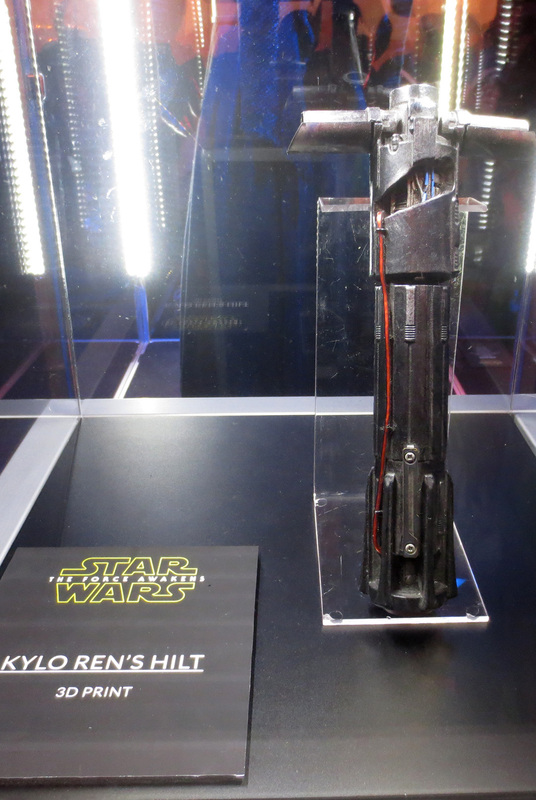 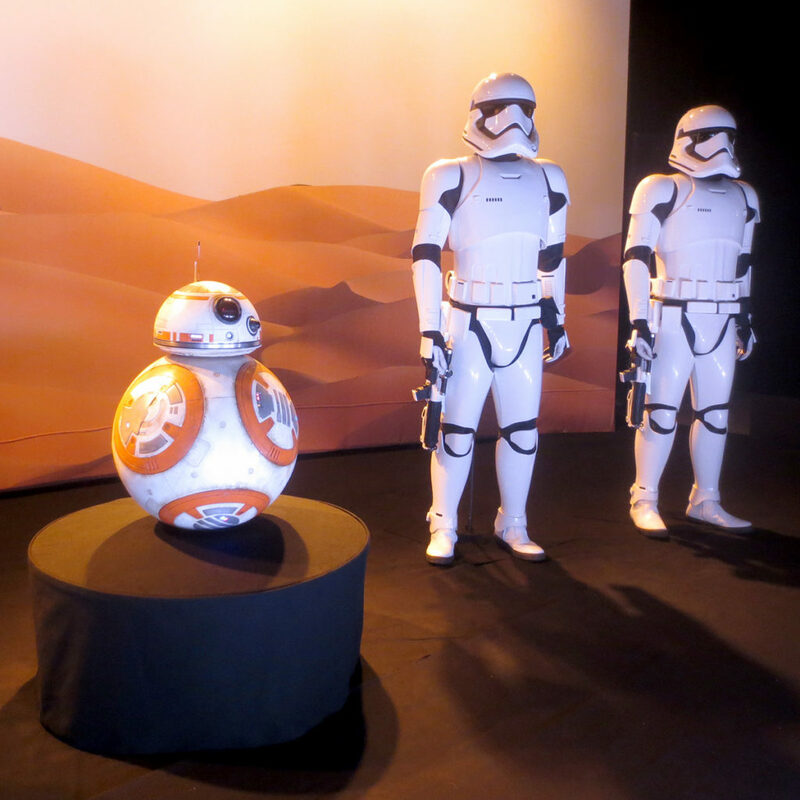 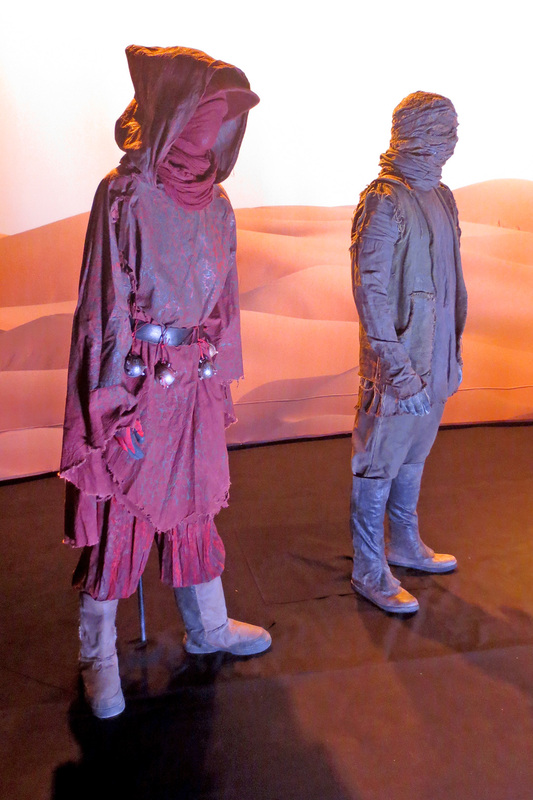 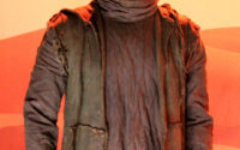 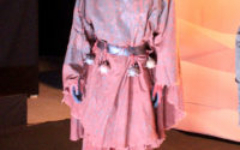 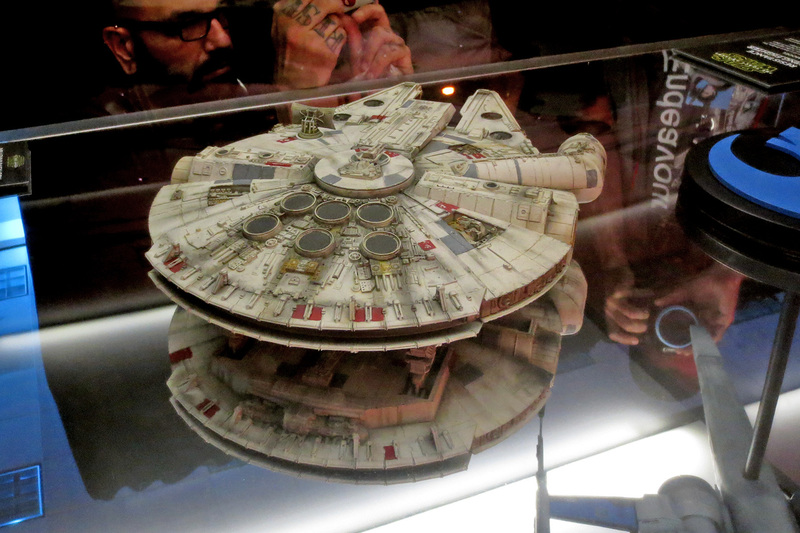 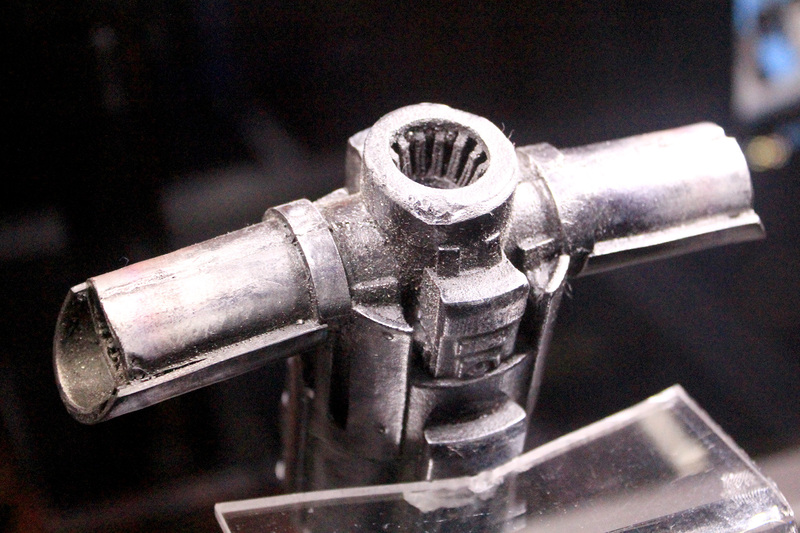 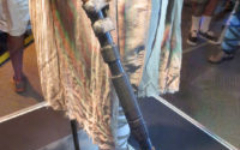 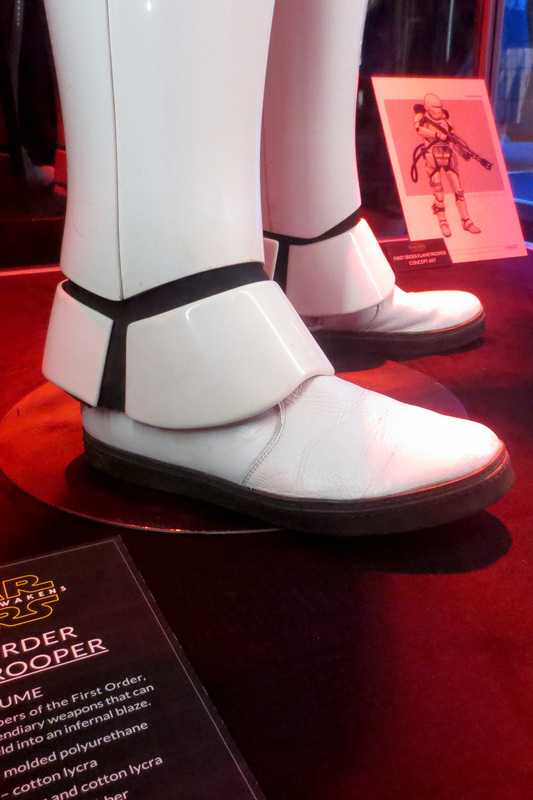 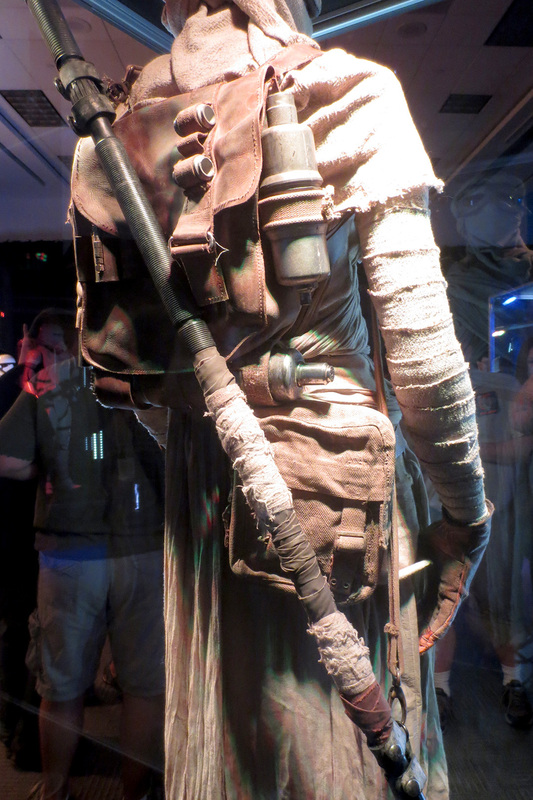 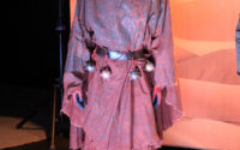 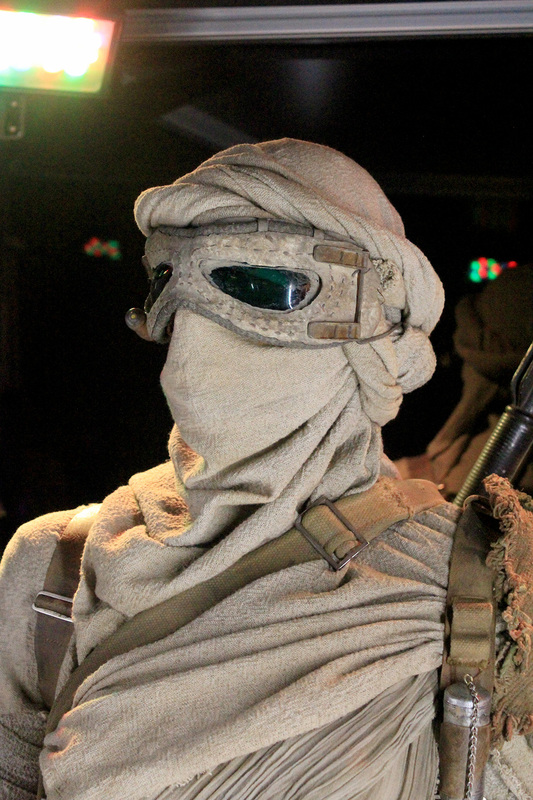 One of the most popular ongoing exhibits at the Star Wars Celebration Anaheim convention (April 16-19, 2015) was a collection of costumes and props from the upcoming Star Wars film, Episode 7 aka The Force Awakens. 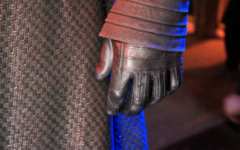 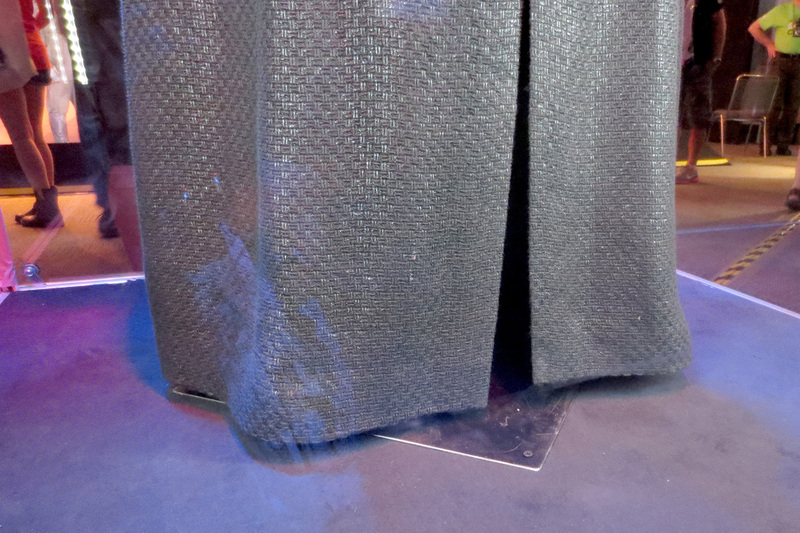 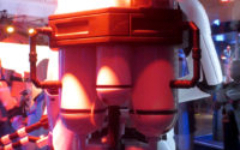 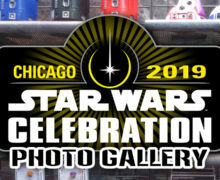 This attraction was in fact an unexpected addition to the Celebration offerings, only being revealed a day or two in advance of the event opening. 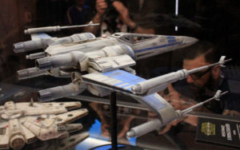 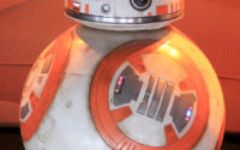 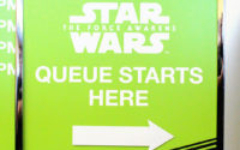 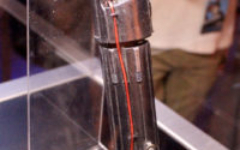 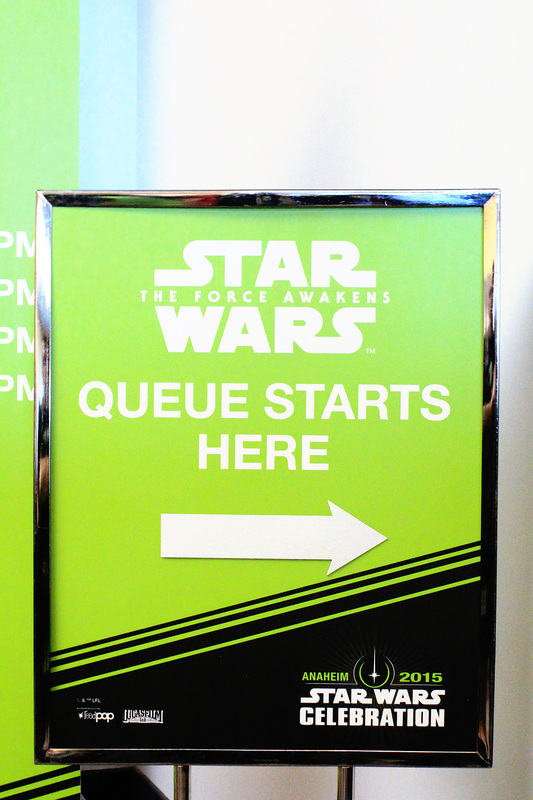 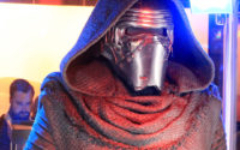 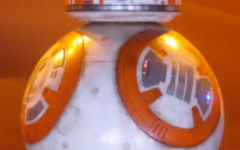 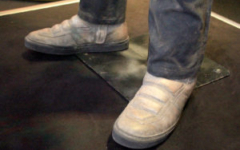 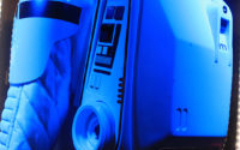 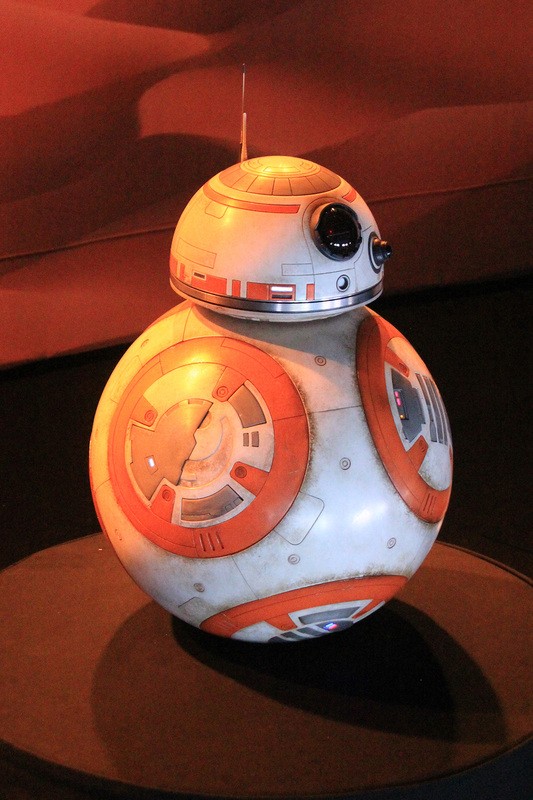 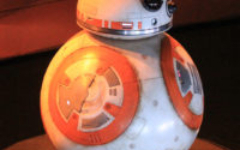 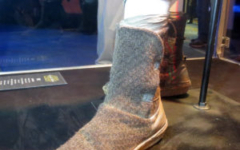 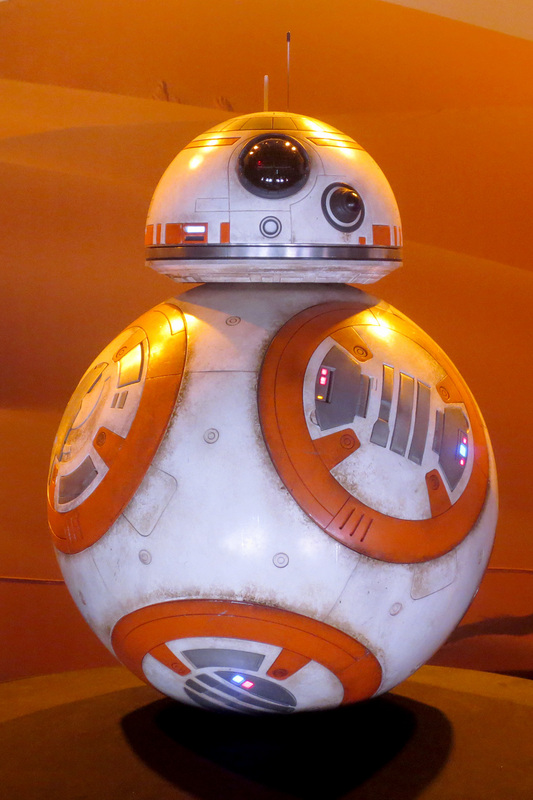 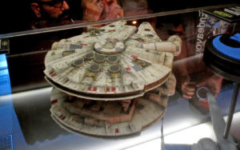 Once the word got out, the entry lines grew rapidly, as fans eagerly competed to get in and see the newly revealed characters, spaceships, and concept art from The Force Awakens. 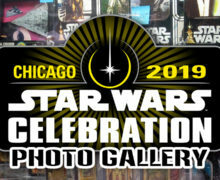 If you chose to add this exhibit to your agenda early in the convention, wait times were only in the order of 30-ish minutes…later though, they grew to the 1-2 hour range, often needing to be capped nearer the end of the day. 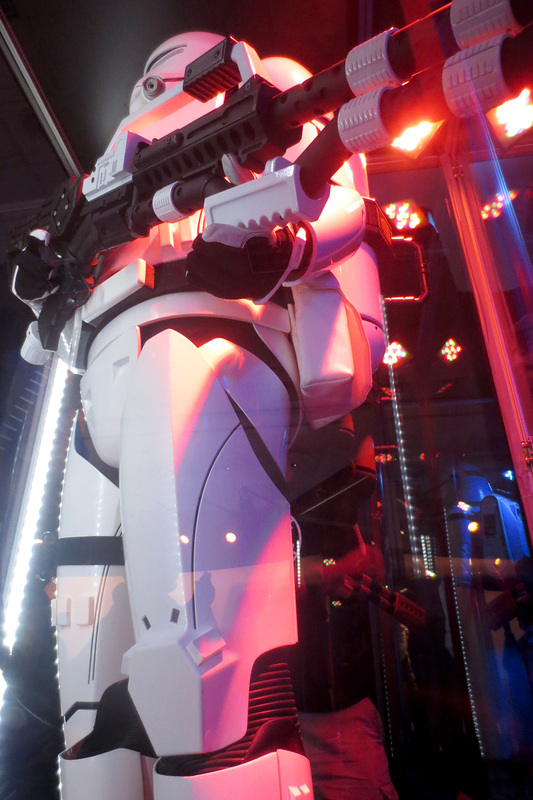 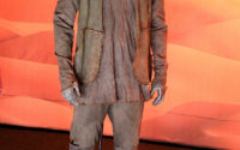 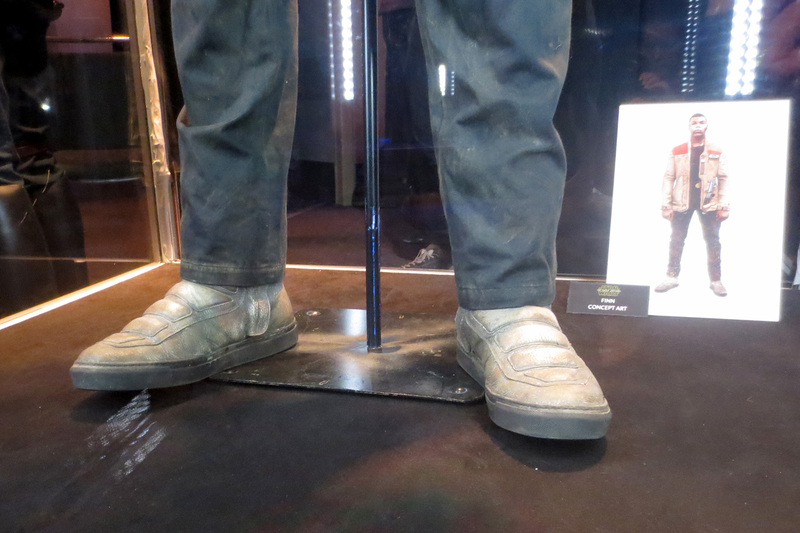 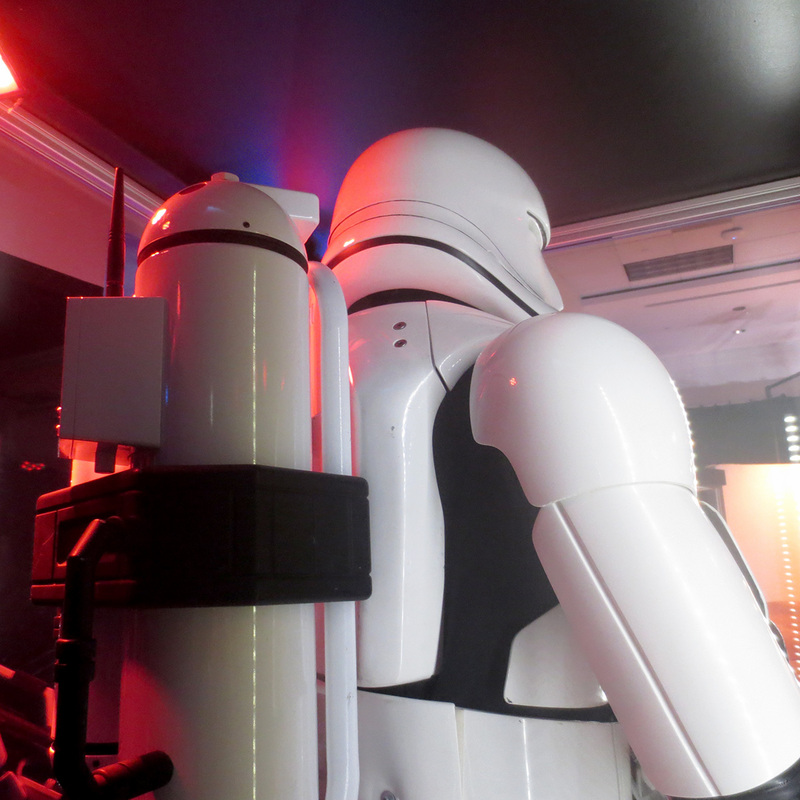 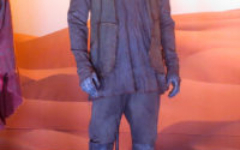 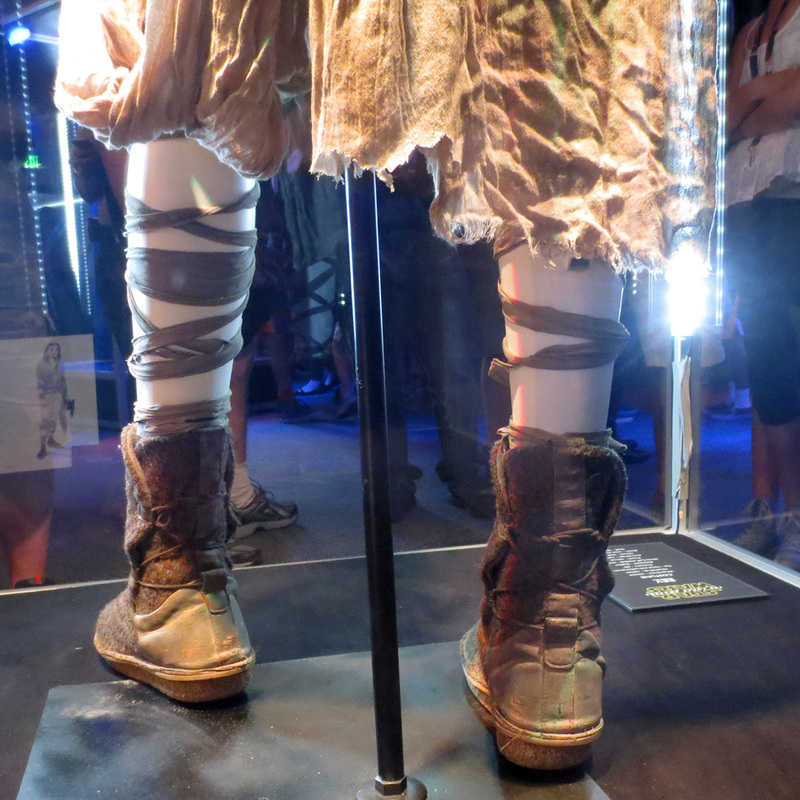 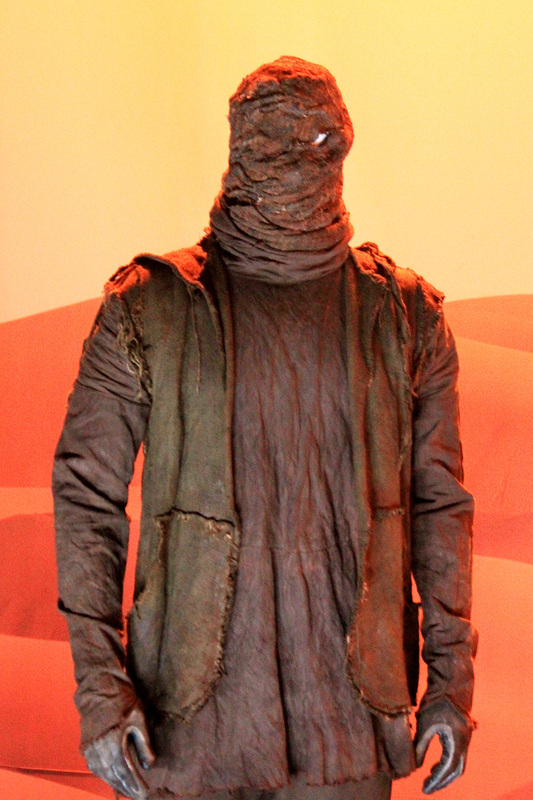 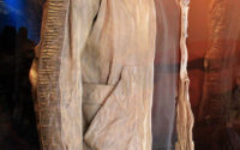 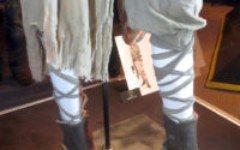 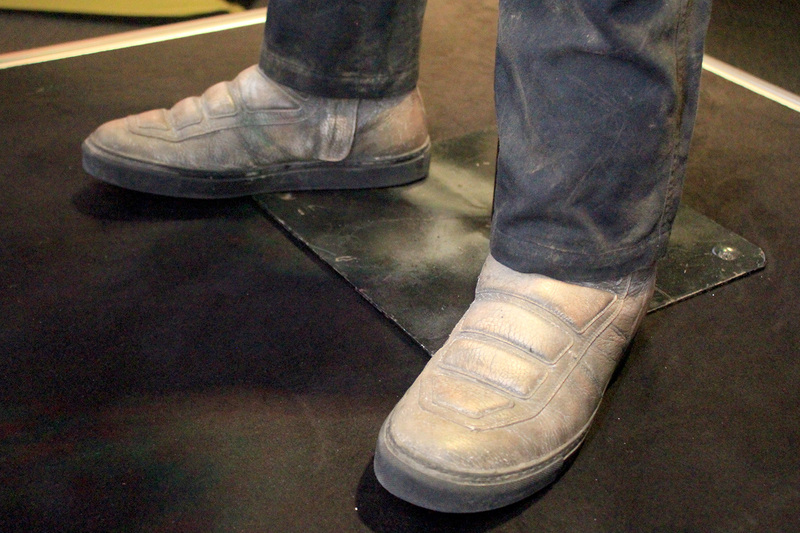 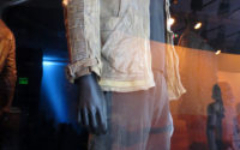 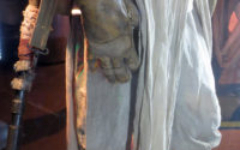 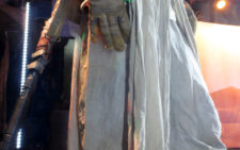 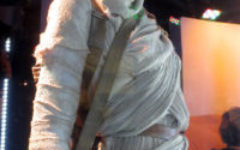 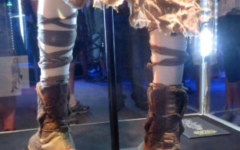 Once in, fans were treated to a fairly broad array of life-size statues and scaled models. 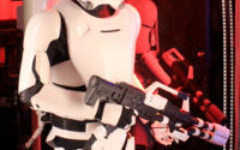 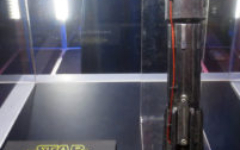 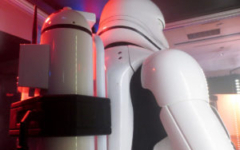 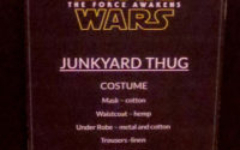 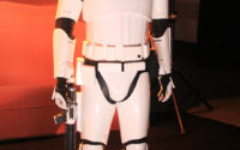 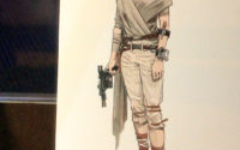 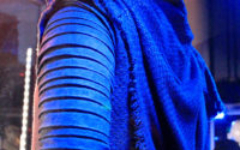 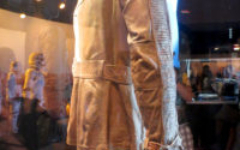 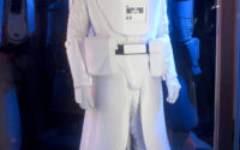 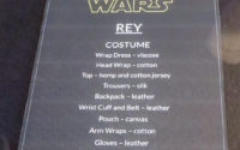 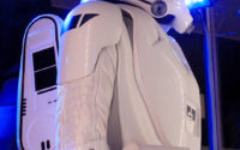 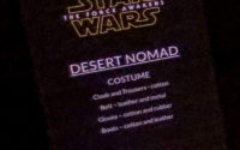 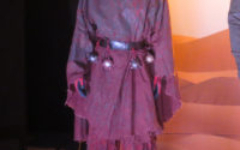 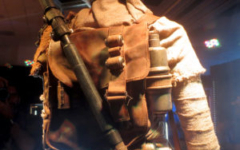 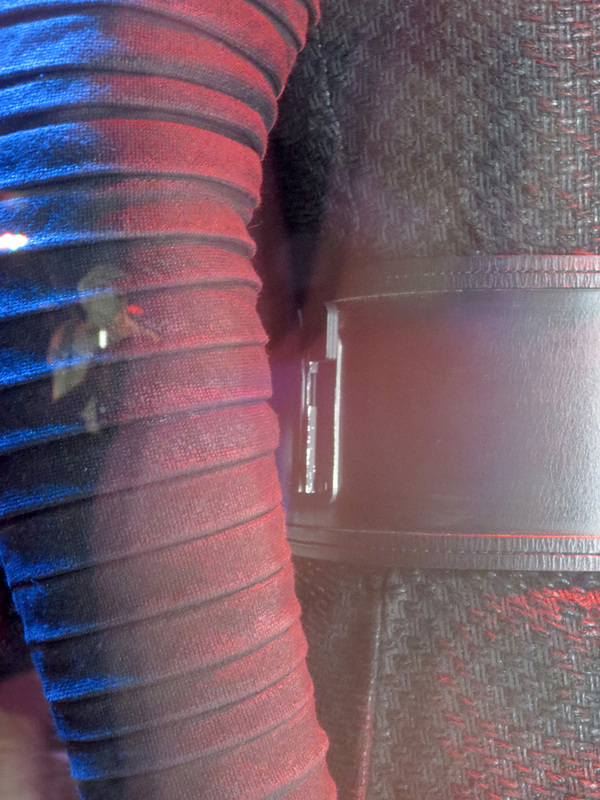 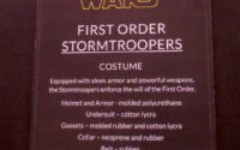 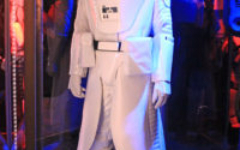 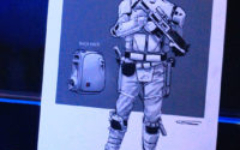 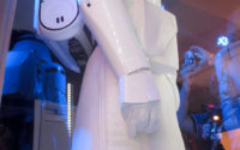 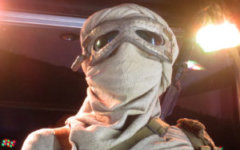 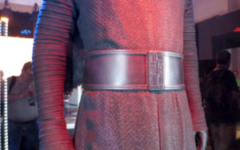 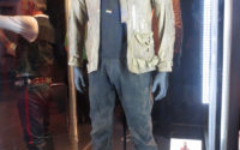 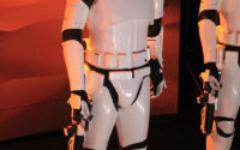 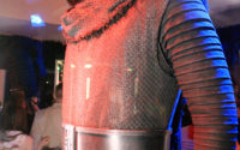 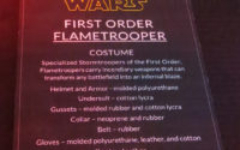 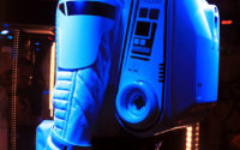 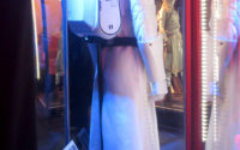 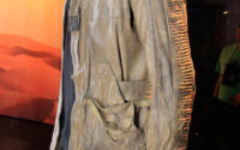 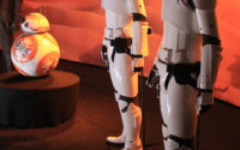 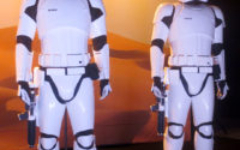 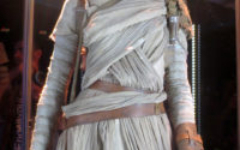 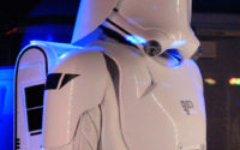 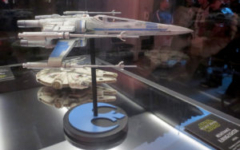 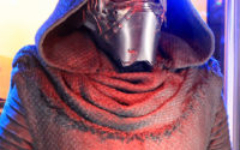 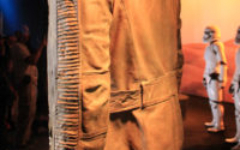 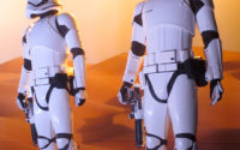 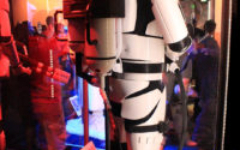 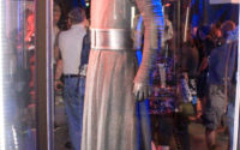 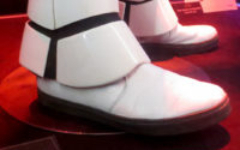 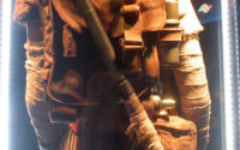 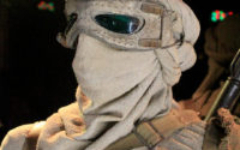 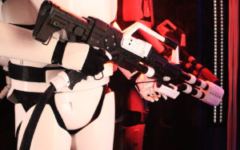 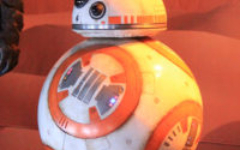 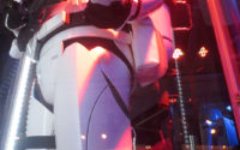 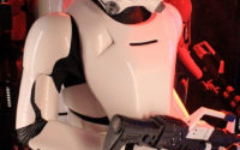 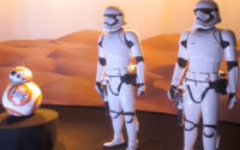 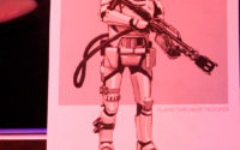 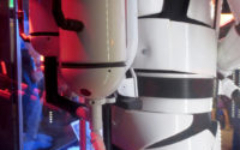 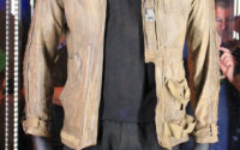 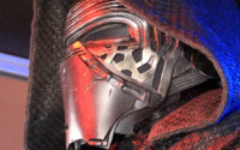 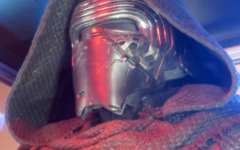 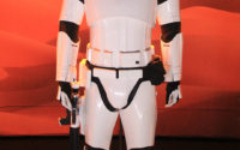 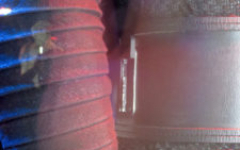 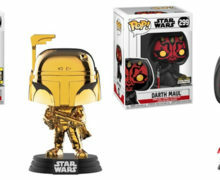 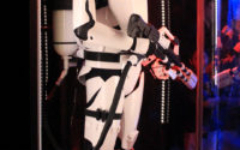 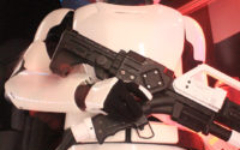 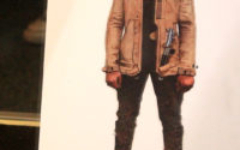 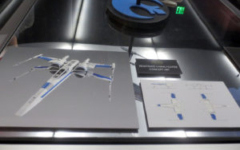 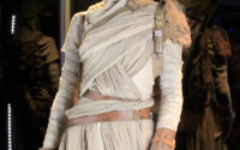 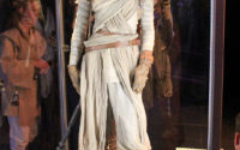 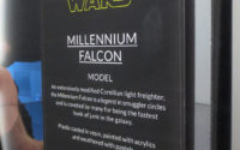 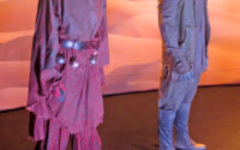 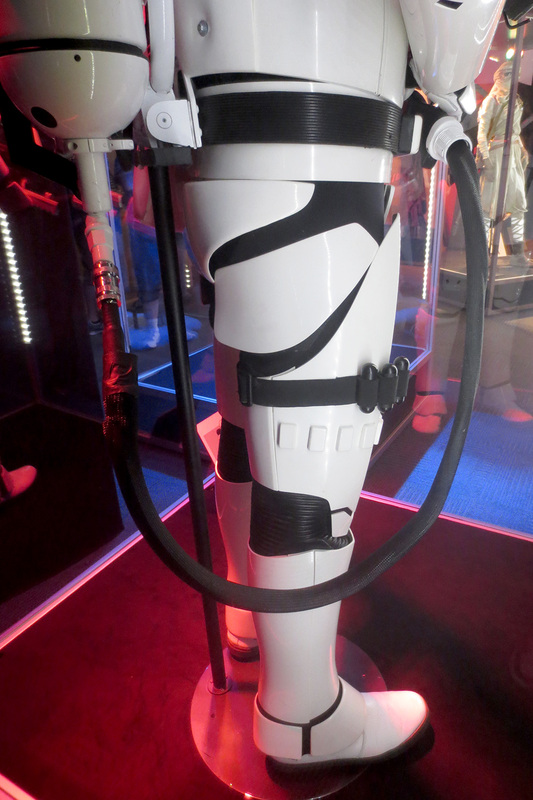 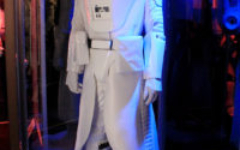 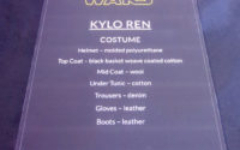 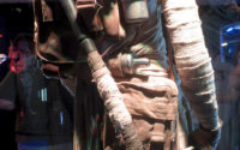 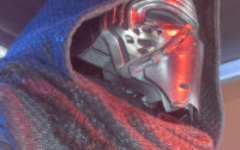 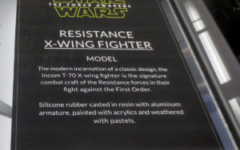 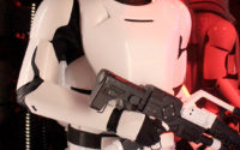 Full ensembles for heroes Rey and Finn, full access to all the details of Kylo Ren’s dark garb and lightsaber, a resistance x-wing, the Millennium Falcon, First Order soldiers including flame-troopers, snowtroopers and stormtroopers, a couple of Jakku residents, and the ever popular BB-8. 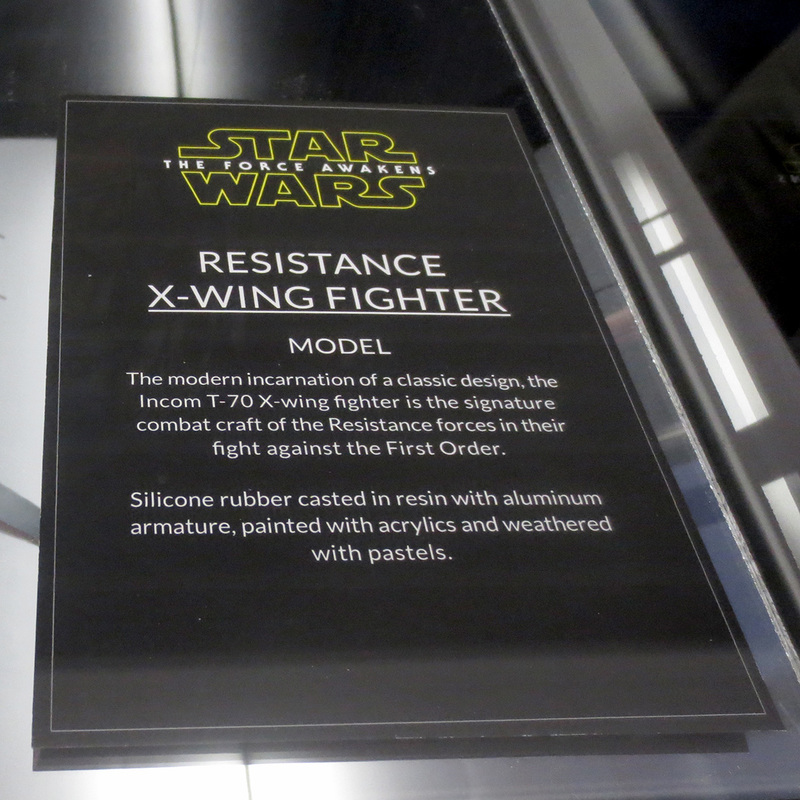 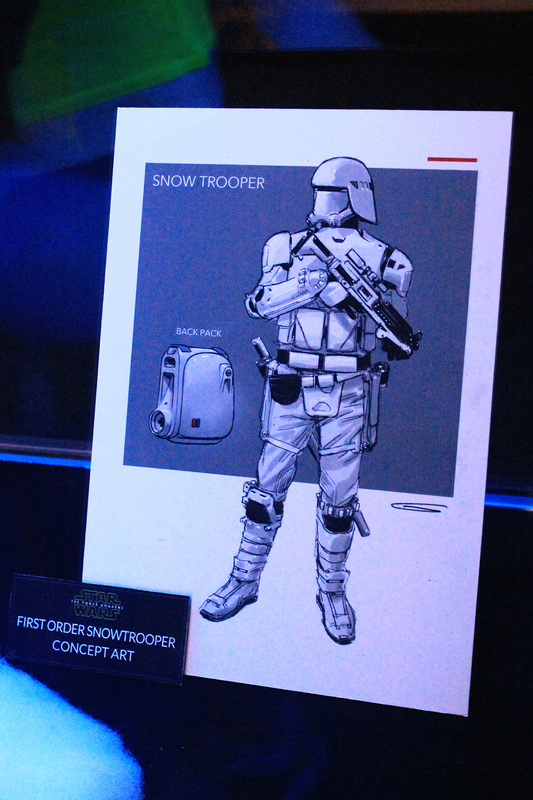 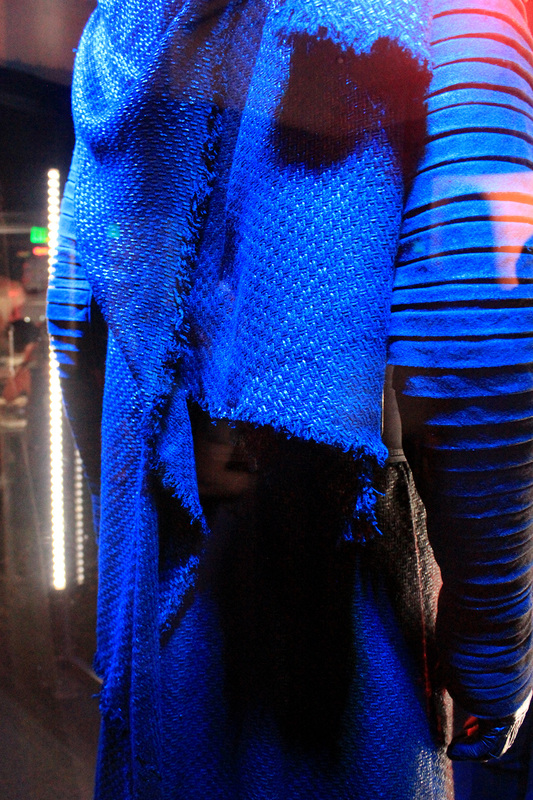 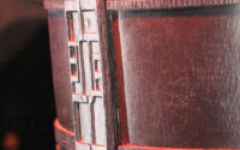 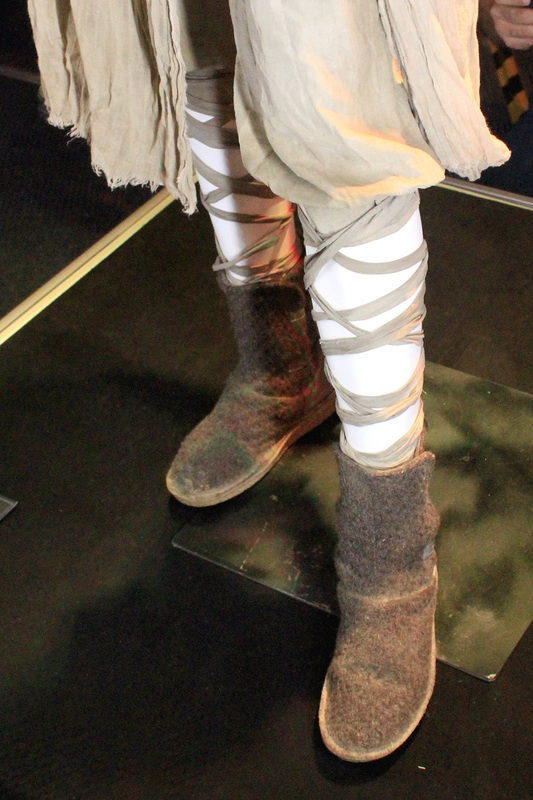 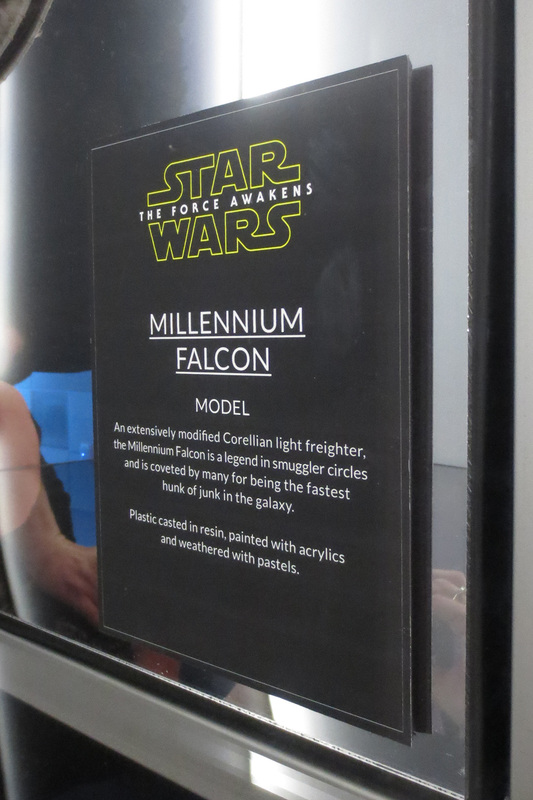 Each display included corresponding concept art and descriptions of construction material and processes used.